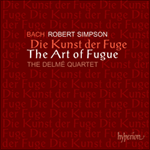 The Art of Fugue is universally upheld as a major intellectual tour de force of Western civilisation; one of the great wonders of musical art. Above all it summarizes the entire known potential of counterpoint. n. the art of combining melodies. adj. contrapunt'al [Fr. contrepoint and It. contrappunto—L. contra, against, punctum, a point. points or notes placed against those of the melody. Etymology is well and good. But the form is only understood when its principles are fully realised as they are within this masterpiece. No-one understood the workings of counterpoint more fully than Bach and in his final years the composer, then Cantor at St Thomas’s, Leipzig, was more and more preoccupied with contrapuntal music. He completed the ‘Goldberg Variations’ (1742), the Musical Offering (1747, see above) and variations on ‘Vom Himmel hoch’ (1747). By 1748 he was ready for a great, final summation; a work with every manner of contrapunct and canon based on one great theme. The following year work commenced and, despite the ravages of a fatal eye disease, this final profound undertaking was almost completed in the year of his death (1750). It proved a monumental revelation, an unfinished series of contrapuntal variations imbued with unfailing variety and limitless imagination. 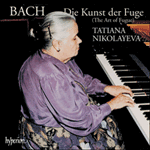 While creating The Art of Fugue, the 65-year-old Bach embodied within the work unparalleled splendour and poetry. But his overriding aim was purely to exhibit the comprehensive possibilities of a single, simple ‘subject’ with various types of fugal and canonic writing. The debilitating final disease prevented its completion. But during his final months, work on publishing The Art of Fugue had already begun. A complete version in Bach’s autograph predates the published one and the formal copper engraving was partially supervised by him. However, it could hardly be said to bear his imprimatur for at some point members of the family began passing pages to the ‘unknown’ engraver who continued working from the manuscript with no thought or understanding of the music or its true sequence. Bach’s son Carl Philipp Emanuel eventually took charge of the publication and it appeared posthumously in autumn 1751. The results were messy and bewildering and performers looked at the work in utter confusion. The Art of Fugue was regarded as a labyrinthine exercise; a drily academic tangle of uncommon severity. This widely held view meant that Bach’s towering masterpiece suffered undeserved neglect and obscurity for much of its history. Carl Czerny and Philipp Spitta regarded it as a keyboard work. But difficulties arose from the incomplete form. Bach had not finished the final fugue, superscribed ‘Fuga a soggeti’ in the printed version. And aspects of the original printing were the subject of unending speculation. The opening four fugues pose no problems. Indeed there is no great stumbling block up to Contrapunctus 11. Most academics detect Bach’s influence in the ordering of the pieces to this point though several ponder over the use of three (not four) ‘stretto’ counter fugues; Contrapuncti 5-7. Still greater difficulties arise with the remaining unnumbered items, so quixotically arranged in the first print. Until the present century many would-be performers remained doubly flummoxed as the score bore no directions about the work’s instrumentation. Credit for its twentieth-century revival must go to the young Swiss student Wolfgang Graeser (1906–28). He painstakingly unravelled the tangle and in 1924 prepared a running order with the canons and fugues set for various groups of instruments. The Graeser version was first heard in 1927 at a concert in the Leipzig church of St Thomas. Karl Straube directed. Interest was enormous. Musicians everywhere took note and the academic fraternity considered the event a watershed in our understanding of eighteenth-century music. 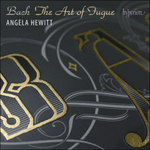 Beyond the hub of Bach’s continent, The Art of Fugue was now reconsidered with equal zeal, thought of less as the last disordered, creative gasp of a dying man and more the comprehensive, consummate summation of Bach’s immeasurable genius. News of this event spread through Europe like wildfire. It crossed the Atlantic and within two years Stokowski presented Graeser’s orchestral version at Mrs Coolidge’s Chamber Music Festival in the Library of Congress, Washington. By 1930 and 1931 New York audiences were witness to performances by the Juilliard Graduate School under director Albert Stoessel. In fact Graeser had simply split the work into two parts, each one beginning with limited forces (string quartet or harpsichord). From this base the instrumentation was progressively enlarged, first to chamber ensemble proportions and then to full orchestral dimensions. In the first eleven fugues Graeser adopted the order of the original; his first half comprised the four simple fugues, the three inverted fugues and the four double/triple fugues. His second part had the canons, mirror fugues and the quadruple fugue. Graeser’s arrangement was soon set aside in favour of more economical instrumentations. Weighty orchestral incarnations all but vanished. By this time the work was most usually heard with chamber orchestras or from string quartets. Bach’s four-part writing led to still more experimentation with a variety of groupings. Organists turned to The Art of Fugue and the work was re-examined yet again. In 1932 Tovey endorsed the nineteenth-century belief that the work had been intended for the keyboard. He published an open-score edition as well as one for keyboard. Like other performers and academicians he also produced a ‘complete’ version of the final, four-part fugue which breaks off after measure 239. Whether Bach intended his variations for the organ or harpsichord, for chamber group or orchestra, remains unclear to this day. Gustav Leonhardt contends that a mere glance at the compass of the alto voice in the first twelve fugues will reveal how none of Bach’s ensemble groups may properly be used in performing the work. ‘Every instrumentation must resort to a completely anachronistic group of instruments,’ he says. And he adds, ‘no single voice has a specific instrumental character. This … may account for the greater variety of instrumental attempts.’ The Dutch harpsichordist and scholar explains that Bach never used the soprano clef for flute, oboe or violin. But the clefs he does specify were widely accepted for classical polyphony and equally for keyboard instruments. As we have seen, the nature of instrumentation is not documented. Moreover it appears to have been submitted as an abstract counterpoint, independent of any particular instrumental setting. Such observations have led to a paradoxical theory that Bach was wholly unconcerned about the eventual performance. Which raises the question—was The Art of Fugue merely set down as an elaborate intellectual exercise? C P E Bach himself thought the work’s greatest value was as a teaching aid. He declared, ‘Every student of the art … cannot fail to learn from it how to compose a good fugue and will therefore need no oral teacher, who often charges dearly enough.’ Schweitzer took a similar view in his J S Bach, le musicien-poète (1905). By 1756 The Art of Fugue had sold only thirty copies and 120 years later it was similarly overlooked but for the sporadic publication of a few keyboard editions. After the attentions of Graeser and Tovey in the late ’20s and early ’30s, a number of keyboard artists revived the work. Each one argued persuasively that The Art of Fugue was most properly suited to his/her own instrument. Bach began his monumental task with four fugues, two presenting the theme, the others running in contrary motion. Added to this were counterfugues where the first statement is inverted and recombined with its original form. Then there were double and triple fugues, four canons and two pairs of mirror fugues. Karl Geiringer notes: ‘To make the mirror reflection doubly realistic, the treble of the first fugue becomes the bass of the second, the alto changes into a tenor, the tenor into an alto and the bass into a treble.’ The inversus appears like the rectus standing on its head. In fact the order of pieces on the autograph differs from that established from the printed version. The autograph is demonstrably in Bach’s hand while details of the printed version are, even now, not finally authenticated. Numbering of the first (scrupulously engraved) pieces may be based on a second ‘lost’ autograph, changed from the original layout by Bach himself. Ordering of the mirror fugues remains the subject of prolonged and inconclusive debate. L’Art de la fugue est universellement considéré être un important tour de force intellectuel de la civilisation occidentale; l’une des grandes merveilles de l’art musical. Mais par dessus tout, il résume le potentiel connu entier du contrepoint. Les dictionnaires courants définissent ainsi le contrepoint: n.m. (de contre et point «note», les notes étant figurées par des points). Art de composer de la musique en superposant des dessins mélodiques. Voilà pour les dictionnaires. Mais la forme n’est comprise que lorsque ses principes sont complètement réalisés comme ils le sont dans ce chef-d’œuvre. Personne ne comprit mieux le fonctionnement du contrepoint que Bach et dans ses dernières années le compositeur, alors Chef de choeur à St Thomas (Leipzig), s’intéressait de plus en plus à la musique contrapuntique. Il acheva les Variations «Goldberg» (1742), L’Offrande musicale (1747, voir ci-dessus) et les variations sur «Vom Himmel hoch» (1747). Dès 1748, il était prêt à faire un grandiose résumé final; une œuvre possédant toutes manières de contrepoints et de canons basés sur un seul grand thème. L’année suivante il se mit au travail et malgré les ravages d’une maladie fatale des yeux, cette dernière tâche profonde et gigantesque était presqu’achevée l’année de sa mort (1750). Ce fut une révélation monumentale, une série inachevée de variations contrapuntiques imprégnées d’une inépuisable variété et d’une imagination sans limites. En créant L’Art de la fugue, Bach alors âgé de 65 ans, mit dans l’œuvre une splendeur et une poésie sans pareilles. Mais son premier objectif était tout simplement d’illustrer toutes les possibilités d’exploitation d’un seul sujet simple dans divers types d’écriture fuguée et canonique. La maladie mortelle débilitante en empêcha l’achèvement. Néanmoins le travail de publication de L’Art de la fugue avait déjà commencé quelques mois avant sa mort. Une version complète de la main de Bach précède la version publiée et les gravures sur cuivre de rigueur furent en partie supervisées par lui. Mais il serait difficile de prétendre qu’elles portent son imprimatur car à un moment donné des membres de sa famille commencèrent à remettre des pages à ce graveur «inconnu» qui continua à travailler d’après le manuscrit sans réfléchir ni comprendre la musique ni sa vraie séquence. Le fils de Bach, Carl Philipp Emanuel, finit par se charger de l’édition qui parut à titre posthume en automne 1751. Les résultats en furent un désordre déroutant qui jeta les musiciens qui examinaient l’œuvre dans la confusion la plus totale. L’Art de la fugue était considéré comme un exercice labyrinthique; un fouillis académique et sec d’une austérité peu commune. Cette opinion très répandue signifie que le chef-d’œuvre magistral de Bach a fait l’objet d’une négligence imméritée et est resté dans l’obscurité pendant la plus grande part de son histoire. Carl Czerny et Philipp Spitta jugeaient que c’était une œuvre pour le clavier. Des difficultés surgirent à cause de son état inachevé. Bach n’avait pas terminé la fugue finale, qui porte l’inscription «fuga a soggeti» dans la version imprimée. Et certains aspects de l’édition originale firent l’objet de spéculations interminables. Les quatre fugues d’ouverture ne posent aucun problème. D’ailleurs il n’y pas vraiment de pierre d’achoppement avant le Contrapunctus 11. La majorité des musicologues détectent l’influence de Bach dans le classement des morceaux jusque-là, bien que plusieurs se posent des questions sur l’utilisation de trois (et non quatre) contre-fugues en «strette»: Contrapuncti 5–7. Des difficultés encore plus grandes surviennent avec les morceaux restants non numérotés, si étrangement arrangés dans la première édition. Jusqu’à ce siècle-ci, de nombreux exécutants en puissance sont restés doublement perplexes devant l’absence d’indications instrumentales dans la partition. Nous devons cette reprise du vingtième siècle au jeune étudiant suisse Wolfgang Graeser (1906–28). Il débrouilla laborieusement cet enchevêtrement et en 1924 prépara un ordre d’exécution avec les canons et les fugues arrangés pour divers groupes d’instruments. La version de Graeser fut entendue pour la première fois en 1927 lors d’un concert donné à l’Eglise St Thomas de Leipzig sous la direction de Karl Straube. L’intérêt suscité fut énorme. Partout les musiciens prenaient note et la confrérie universitaire jugea que l’évènement jetait une lumière entièrement neuve sur notre compréhension de la musique du dix-huitième. L’Art de la fugue était maintenant rééxaminé avec autant de zèle par-delà les frontières d’Europe centrale; considéré moins comme le dernière souffle créatif désordonné d’un mourant que la somme parachevée complète du génie incommensurable de Bach. La nouvelle de l’évènement se répandit à travers toute l’Europe comme une traînée de poudre. Elle traversa l’Atlantique et en l’espace de deux ans, Stokowski présentait la version orchestrale de Graeser au Festival de Musique de Chambre de Mrs Coolidge à la Bibliothèque du Congrès, à Washington. Dès 1930 et 1931 le public new-yorkais assistait à des concerts donnés par la Juilliard Graduate School sous la direction d’Albert Stoessel. En fait Graeser avait simplement divisé l’œuvre en deux parties, chacune commençant avec des forces limitées (quator à cordes ou clavecin). L’instrumentation s’élargit progressivement à partir de cette base, en prenant d’abord des proportions d’ensemble de musique de chambre pour arriver aux dimensions orchestrales complètes. Dans les onze premières fugues Graeser a adopté l’ordre de l’original; sa première moitié comprenait les quatre fugues simples, les trois fugues renversées et les quatre doubles/triples fugues. Sa deuxième partie englobait les canons, les fugues miroirs et la fugue quadruple. L’arrangement de Graeser fut rapidement mis de côté pour faire place à des instrumentations plus économiques. Les pesantes incarnations orchestrales disparurent ni plus ni moins. A partir de ce moment-là, l’œuvre était généralement jouée par des orchestres de chambre ou des quators à cordes. La composition de Bach en quatre parties donna lieu à d’autres expériences avec toute une variété de groupements instrumentaux. Les organistes se tournèrent vers L’Art de la fugue et l’œuvre fut examinée de nouveau. En 1932, Tovey adoptait la croyance du dix-neuvième siècle selon laquelle l’œuvre avait été écrite pour le clavier. Il publia une partition à une partie par portée ainsi qu’une autre pour clavier. Tout comme d’autres musiciens et musicologues, il sortit aussi une version «complète» de la fugue finale à quatre parties qui s’interromp après la 239ème mesure. Nous ne savons toujours pas très bien de nos jours si Bach destinait ses variations à l’orgue ou au clavecin, à un groupe de musique de chambre ou à un orchestre. Gustav Leonhardt prétend qu’un seul coup d’œil à la portée de la partie alto dans les douze premières fugues, suffit à révéler comment aucun des groupes d’ensemble de Bach ne peut servir à exécuter l’œuvre correctement. «Chaque instrumentation doit avoir recours à un groupe d’instruments complètement anachronique», dit-il. Et il ajoute: «Aucune voix seule ne possède un caractère instrumental spécifique. Ceci … peut expliquer la plus grande variété des tentatives instrumentales». Le claveciniste et musicologue néerlandais explique que Bach n’utilisait jamais ut1 pour la flûte, le hautbois ou le violon. Mais les clefs qu’il spécifiait, étaient couramment acceptées pour la polyphonie classique et tout autant pour les instruments à clavier. Comme nous l’avons vu, la nature de l’instrumentation n’est pas documentée. Qui plus est, elle semble avoir été présentée comme un contrepoint abstrait, indépendamment de toute précision instrumentale particulière. De telles observations ont conduit à une théorie paradoxale selon laquelle Bach ne se préoccupait absolument pas de son exécution éventuelle. Ce qui pose à son tour la question de savoir si L’Art de la fugue a uniquement été écrit comme un exercice intellectuel élaboré? Le musicologue allemand, Friedrich Blume avance que Bach envisageait son œuvre comme une activité ésotérique, une transmission désintéressée de théorie purement abstraite: «Bach désirait poursuivre une tradition de talent contrapuntique parfait … héritée de l’école (romaine) de l’époque de Palestrina en passant par Sweelinck, Theile, Werckmeister et Vitali». C P E Bach lui-même pensait que la valeur primordiale de l’œuvre était comme aide didactique. Il déclara, «chaque élève de l’art … ne peut s’empêcher d’apprendre par cette œuvre, comment composer une bonne fugue et n’aura donc pas besoin de professeur oral qui prend souvent assez cher». Schweitzer adopta une opinion semblable dans son J S Bach, le musicien-poète (1905). En 1756 trente exemplaires seulement de L’Art de la fugue avaient été vendus et 120 ans plus tard cette œuvre était tout aussi ignorée à part la rare publication de quelques éditions pour clavier. Suite à l’intérêt porté à cette œuvre par Graeser et Tovey vers la fin des années vingt et au début des années trente, plusieurs artistes du clavier la reprirent. Chacun soutenant avec la plus grande persuasion que L’Art de la fugue convenait le mieux à son instrument. Bach commença son travail monumental avec quatre fugues, deux qui présentent le thème et les autres qui défilent dans le sens inverse. Puis il ajouta des contre-fugues dans lesquelles le premier énoncé est renversé et recombiné dans sa forme originale. Nous avons ensuite les doubles et triples fugues, quatre canons et deux paires de fugues miroirs. Karl Geiringer note: «Pour que ce reflet de miroir soit doublement réaliste, la partie de dessus de la première fugue devient la basse de la seconde, l’alto se change en ténor, le ténor en alto et la basse en voix de dessus». L’inversus semble être le rectus debout sur sa tête. En fait l’ordre des morceaux de l’exemplaire manuscrit diffère de celui qui a été établi pour la version imprimée. Le manuscrit est certainement de la main de Bach tandis que les détails de la version imprimée ne sont toujours pas définitivement authentifiés. La numérotation des premiers morceaux (scrupuleusement gravés) est peut-être basée sur un deuxième manuscrit «perdu», sur lequel Bach lui-même aurait modifié l’agencement original. L’ordre des fugues miroirs fait toujours l’objet de débats prolongés et non concluants. Die Kunst der Fuge wird gemeinhin als eine der bedeutendendsten intellektuellen Glanzleistungen der westlichen Zivilisation betrachtet, als eins der großen musikalischen Wunder. Vor allem gipfelt sich in ihr der Kontrapunkt in allen seinen bekannten Möglichkeiten. Laut Wörterbuch ist ein Kontrapunkt: die Kunst, mehrere Stimmen als selbständige Melodielinien nebeneinander zu führen, z.B. in Fuge und Kanon; eigentlich „das Setzen einer Gegenstimme zur Melodie“ (punctus contra punctum, Note gegen Note). Soweit die Ethymologie. Diese Musikform läßt sich jedoch nur verstehen, wenn alle ihre Elemente völlig realisiert werden, wie es in diesem Meisterwerk der Fall ist. Keiner verstand die Gesetzesmäßigkeiten des Kontrapunktes besser als Bach. Gegen Ende seiner kompositorischen Laufbahn, als er als Kantor der Thomaskirche zu Leipzig tätig war, beschäftigte er sich mehr und mehr mit der Kontrapunktik. Er hatte die Goldberg-Variationen (1742), das Musikalische Opfer (1747, s. oben) und die Kanonischen Veränderungen über „Vom Himmel hoch“ (1747) beendet und nun, im Jahre 1748, war er soweit, sein Schaffen in einem letzten Höhepunkt zusammenzuführen, in einem Werk, dem ein einziges Thema mit jederart Kontrapunkt und Kanon zugrunde liegt. Er begann mit der eigentlichen Arbeit im folgenden Jahr, und es gelang ihm, trotz eines schweren Augenleidens dieses Werk im Jahr seines Todes (1750) mehr oder weniger zu vollenden. Die Kunst der Fuge erwies sich als eine monumentale Offenbarung, als eine unvollendete Reihe von kontrapunktischen Variationen, die von einer unerschöpflichen Vielfalt grenzenloser Phantasie durchdrungen sind. Der 65jährige Bach brachte in der Kunst der Fuge unermeßliche Erhabenheit und Poesie zum Ausdruck. Und doch war seine Absicht in erster Linie gewesen, die Möglichkeiten eines einzelnen, einfachen „Themas“ auf verständliche Weise durch stilmäßig unterschiedliche Fugen- und Kanonkompositionen darzustellen. Sein Augenleiden machte die Vollendung des Werkes zwar unmöglich, doch war noch zu seinen Lebzeiten mit den Vorbereitungen zur Veröffentlichung begonnen worden. Eine vollständige Fassung von Bachs Autograph ging der veröffentlichten voraus, auch war der offizielle Kupferstich noch von ihm selbst beaufsichtigt worden. Man kann jedoch kaum behaupten, daß dieser sein Imprimatur trägt, da von Zeit zu Zeit Mitglieder seiner Familie einige Blätter dem „unbekannten“ Graveur zutrugen, der an dem Manuskript ohne Verständnis der Musik oder Kenntnis der Reihenfolge arbeitete. Bachs Sohn Carl Philipp Emanuel übernahm am Ende die Veröffentlichung, die postum im Herbst 1751 erschien. Das Ergebnis war ein so heilloses Durcheinander, düß die aufführenden Künstler nur voller Verwirrung darauf starren konnten. Die Kunst der Fuge wurde als eine labyrinthische Übung betrachtet, eine trockene akademische Verwicklung von ungewöhnlicher Strenge. Diese weit verbreitete Auffassung bedeutete, daß dieses überwältigende Meisterwerk Bachs lange Zeit unverdientermaßen vernachlässigt und vergessen blieb. Carl Czerny und Philipp Spitta wollten es als ein Musikstück für Tasteninstrumente verstanden wissen. Schwierigkeiten ergaben sich aus seiner unvollendeten Form. Bach hatte die letzte Fuge, in der Druckausgabe als „Fuga a soggeti“ bezeichnet, nicht fertiggestellt. Außerdem waren Aspekte des Urdrucks nicht endenden wollenden Spekulationen unterworfen. Die ersten vier Fugen stellen kein Problem dar; in der Tat verläuft alles glatt bis zum Contrapunctus 11. Die meisten Musikforscher erkennen Bachs Einfluß auf die Anordnung der Stücke bis zu diesem Punkt an, obwohl Fragen aufgeworfen wurden in bezug auf drei (nicht vier) „stretto“ Gegenfugen; Contrapuncti 5-7. Größere Probleme stellen sich mit den nicht numerierten Stücken, die so eigenartig im Erstdruck angeordnet waren. Bis zum gegenwärtigen Jahrhundert gerieten viele Künstler aus dem Konzept, da die Partitur keinerlei Anweisungen zur Besetzung enthielt. Das Verdienst, die Kunst der Fuge im 20. Jahrhundert für die Konzertwiedergabe zugänglich gemacht zu haben, kann ohne Zweifel der früh verstorbene Wolfgang Graeser (1906–1928) für sich in Anspruch nehmen. Er entwirrte gewissenhaft das Ganze und stellte 1924 eine Anordnung auf, in der die Kanons und Fugen für unterschiedliche Instrumentengruppen eingerichtet sind. Diese Version gelangte erstmalig 1927 in der Thomaskirche zu Leipziger unter dem Dirigentenstab von Karl Straube zur Aufführung. Die Graeser-Fassung erweckte außerordentliches Interesse. Weltweit Welt horchten die Musiker auf; die Akademiker sahen sie als den Wendepunkt in unserem Verständnis der Musik des 18. Jahrhunderts an; die Kunst der Fuge wurde nun nicht mehr als der letzte, wirre schöpferische Atemstoß eines sterbenden Menschen angesehen, sondern als die Krönung im Schaffen eines unermeßlichen Genies. Die Nachrichten über diesen Wandel in der Geschichte der Kunst der Fuge verbreiteten sich wie ein Lauffeuer durch Europa und überquerten sogar den Atlantik. Innerhalb von zwei Jahren präsentierte Stokowski Graesers Orchesterbearbeitung zum Anlaß von Mrs Coolidges Kammermusik-Festival in der Bibliothek des Washington Kongreßgebäudes. In den Jahren 1930/31 kamen New Yorks Konzertgänger in den Genuß von Aufführungen durch die Juilliard Graduate School unter Albert Stoessel. Graesers Bearbeitung bestand hauptsächlich daraus, das Werk in zwei Teile aufzuteilen, wobei jeder Teil von entweder Streichquartett oder Cembalo eingeleitet wird. Von dieser Basis ausgehend, nimmt die Instrumentierung nach und nach zu, zunächst auf den Umfang eines Kammerorchesters, dann auf volles Orchester. In den ersten elf Fugen behielt Graeser die Anordnung des Originals bei; diese bestand aus den vier einfachen Fugen, den drei Umkehrungsfugen und den vier Doppel- und Tripelfugen. Die zweite Hälfte umfaßt die Kanons, Spiegelfugen und die Quadrupelfuge. Graesers Anordnung wurde bald durch eine Version mit sparsamerer Instrumentierung ersetzt. Gewichtige Orchesterinkarnationen verschwanden fast völlig, und das Werk wurde meist mit Kammerorchester oder Streichquartett aufgeführt. Bachs vierstimmige Kompositionsweise brachte weitere Experimente mit verschiedenen Gruppenanordnungen mit sich. Organisten wandten sich der Kunst der Fuge zu, und das Werk wurde erneuter Prüfungen unterzogen. 1932 sprach sich Tovey für die im 19. Jahrhundert vertretene Auffassung aus, daß das Werk für Tasteninstrumente vorgesehen war. Er veröffentlichte in diesem Jahr eine Partitur und einen Klavierauszug. Außerdem produzierte er, wie schon andere bevor ihm, eine „vollständige“ Fassung der letzten, vierstimmigen Fuge, die in der erhaltenen Handschrift in Takt 239 abbricht. Ob Bach nun seine Variationen für die Orgel oder das Cembalo, für eine Kammergruppe oder ein Kammerorchester vorgesehen hat, ist bis heute unklar geblieben. Gustav Leonhardt behauptet, daß ein flüchtiger Blick auf den Umfang der Altstimme in den ersten zwölf Fugen offenbart, daß keine von Bachs Ensemblegruppen in der Aufführung des Werkes richtig eingesetzt werden können. „Jede Besetzung muß auf eine völlig anachronistische Instrumentengruppe zurückgreifen,“ meint er. Und fügt hinzu: „Keine einzelne Stimme hat einen besonders instrumentalen Charakter. Dies mag die größere Vielfalt instrumentaler Versuche erklären.“ Der holländische Cembalist und Musikgelehrte erläutert weiterhin, daß Bach niemals den Sopranschlüssel für Flöte, Oboe oder Violine benutzte. Die Schlüssel aber, die er angab, waren weithin gleichermaßen als Schlüssel für klassische Polyphonie sowie für Tasteninstrumente akzeptiert. Beobachtungen wie die Tatsache, daß Bach keine bestimmten Instrumente für das Werk vorgesehen, sondern es als abstrakten Kontrapunkt vorgelegt hat, der an keine spezielle instrumentale Vertonung gebunden ist, haben zu der Theorie geführt, daß Bach sich letzten Endes über die Aufführung der Kunst der Fuge keine Gedanken gemacht hatte. Womit sich die Frage erhebt, ob das Werk allein als eine komplizierte intellektuelle Übung niedergeschrieben wurde. Der deutsche Gelehrte Friedrich Blume argumentierte, daß Bach sein Schaffen als eine esoterische Tätigkeit verstand, als eine unvoreingenommene Übertragung rein abstrakter Theorie; „Bach wollte die Tradition einer vollendeten kontrapunktischen Fertigkeit weiterführen … wie sie von der (römischen) Schule Palestrinas über Sweelinck, Theile, Werckmeister und Vitali überliefert worden war“. C Ph E Bach sah den größten Wert des Werkes als ein Lehrmittel. Er tat kund: „Jeder angehende Musiker kann nicht umhin, hieraus zu lernen, wie man eine gute Fuge komponiert und braucht daher keinen lebenden Lehrer, der oft teuer genug ist.“ Albert Schweitzer vertrat in seinem Essay J S Bach, le musicien-poète (1905) die gleiche Ansicht. Bis 1756 waren nur 30 Exemplare der Kunst der Fuge verkauft worden. 120 Jahre später fand sie bis auf einige wenige Ausgaben für Tasteninstrumente immer noch keine Beachtung. Nachdem Graeser und Tovey Ende der 20er Jahre das Werk bearbeitet hatten, wurde Die Kunst der Fuge von einer Reihe Solisten wieder zum Leben erweckt. Diese Künstler lieferten überzeugende Argumente, daß das Werk sich gerade für ihr jeweiliges Tasteninstrument ganz besonders gut eignete. Leonhardt vertrat die Seite des Cembalos, während Helmut Walcha es für ein Orgelwerk erklärte. Zeitgenössische Musiklexika behandeln den Fall diplomatisch und ohne Partei zu nehmen: „Die Aufführung auf einem Tasteninstrument scheint am nächsten zu liegen.“ Die Tatsache, daß Die Kunst der Fuge als Partitur veröffentlicht wurde, ist unerheblich. In einem von F W Marpurg nachgetragenen Vorwort (1752) erläutert dieser, daß es der damaligen Praxis entsprach, dieserart Musik in Partitur zu publizieren, die dann leichter abzuspielen war. Bach begann seine gewaltige Aufgabe mit vier Fugen, von denen zwei das Hauptthema in seiner Grundform bearbeiten und die anderen beiden in der Umkehrung erscheinen. Hinzu kamen Gegenfugen, in denen das erste Thema umgekehrt und anschließend wieder mit der Grundform kombiniert wird. Weiterhin treten Doppel- und Tripelfugen, vier Kanons und zwei Spiegelfugenpaare auf den Plan. Karl Geiringer bemerkt dazu: „Um die Spiegelung doppelt realistisch zu gestalten, wird die Sopran­stimme der ersten Fuge zum Baß der zweiten, Alt wird zum Tenor, Tenor zum Alt und Baß zum Sopran.“ Die Inversus-Form erscheint als die auf dem Kopf stehende Rectus-Form. Die Anordnung der Stücke unterscheidet sich in der Eigenschrift erheblich von der Druckausgabe. Während erstere eindeutig von Bachs Hand verfaßt wurde, sind bei zweiterer selbst heute noch Teile für echt zu erklären. Der Numerierung der ersten (tadellos gestochenen) Stücke mag eine zweite „verlorengegangene“ Eigenschrift zugrunde liegen, an der Bach selbst Änderungen vorgenommen hatte. Die Anordnung der Spiegelfugen bleibt nach wie vor das Thema langer und ergebnisloser Debatten. Contrapunctus 1: The first of four simple fugues. Here it is played straight and serves to introduce the basic shape and character of the theme. Contrapuncti 1, 2, 3 et 4 sont les quatre simples fugues décrites ci-dessous. La première de quatre fugues canoniques: «alla Ottava», se trouve entre ces contrapuncti d’introduction et trois contre-fugues, c-à-d Contrapunctus 5, Contrapunctus «in Stylo Francese» et Contrapunctus «per Augmentationem et Diminutionem». La seconde fugue canonique: «alla Duodecima in Contrapunto alla Quinta», sert à accentuer la distinction entre les trois contre-fugues de Bach (comme ci-dessus) et les quatre fugues à plusieurs thèmes (Contrapunctus 8, 9 [«alla Duodecima»], 10 [«alla decima»] et 11). Deux autres fugues canoniaques se trouvent entre les fugues à plusieurs thèmes et les deux fugues miroirs. Le canon «per Augmentationem in Contrario Motu», avec sa variation franche de la forme fondamentale du thème principal, s’apparente de façon frappante au Contrapunctus 11. Puis le canon «alla Decima, Contrapuncto alla Terza», avec son renversement syncopé, annonce la première des deux fugues miroirs. Elles sont numérotées Contrapunctus 13 (Rectus et Inversus) et Contrapunctus 12 (Rectus et Inversus) et sont ainsi classées par un processus de simple logique. Ensemble elles conduisent au Contrapunctus 14, la fugue B-A-C-H de clôture. Les vingt pistes peuvent encore être décrites comme suit. Contrapunctus 1: La première de quatre fugues simples. Jouée ici normalement et qui sert à introduire la forme et le caractère de base du thème. Contrapunctus 1: Die erste der vier einfachen Fugen. Stellt Grundform und Charakter des Themas vor. Contrapunctus 2: The four part fugue is played straight. Now the latter part of the theme appears in dotted rhythm. Contrapunctus 2: La fugue à quatre parties est jouée normalement. La dernière partie du thème épouse maintenant un rythme pointé. Contrapunctus 2: Die vierstimmige Fuge wird in ihrer Grundform vorgetragen. Der zweite Teil des Thema tritt hier in punktiertem Rhythmus auf. Contrapunctus 3: The simple four-part fugue reappears. Its main theme is inverted and a chromatic counter-subject is maintained throughout. Contrapunctus 3: La simple fugue à quatre parties réapparaît. Son thème principal est renversé et un contre-sujet chromatique est maintenu à travers tout le morceau. Contrapunctus 3: Die einfache vierstimmige Fuge kehrt Das Hauptthema der einfachen vierstimmigen Fuge erscheint in seiner Umkehrungsform, und ein chromatisches Gegenthema wird in dieser ganzen Fuge beibehalten. Contrapunctus 4: Again Bach employs the same inverted form of his theme. This is a simple four-part fugue with a chromatically moody counter-subject. There is an oblique descending-third reference to a hymn utilised in the cantatas: viz. ‘Wer weiss, wie nahe mer mein Ende’ (‘Who knows how near my end might be’) by the Countess of Schwarzburg-Rudolstadt (1637–1707). Contrapunctus 4: Bach utilise de nouveau la même forme renversée de son thème. Il s’agit d’une simple fugue à quatre partie avec un contre-sujet d’humeur chromatiquement changeante. Il y a une référence oblique en tierce descendante à un hymne utilisé dans les cantates: c-à-d «Wer weiss, wie nahe mer mein Ende» («Qui sait combien ma fin est proche») par la comtesse de Schwarzburg-Rudolstadt (1637–1707). Contrapunctus 4: Wiederum macht Bach von derselben umgekehrten Form des Themas Gebrauch. Hier haben wir eine einfache vierstimmige Fuge mit chromatisch schwermütigem Gegenthema. Eine versteckte absteigende Terz weist auf die Hymne „Wer weiß, wie nahe mir mein Ende“ der Gräfin Schwarzburg-Rudolfstadt (1637–1707) hin. Canon (in Hypodiapason) alla Ottava: One of four canonical fugues. In two parts; the main theme is at first inverted, then played straight with substantial rhythmic changes and embellishments. It develops as a simple canon at the octave and the lower part follows the upper at four bars’ distance. Canon (en diapason plagal) alla Ottava: L’une de quatre fugues canoniques. En deux parties; le thème principal est d’abord renversé, puis joué normalement avec d’importants changements rythmiques et ornements. Il se développe en un simple canon à l’octave et la partie la plus basse suit la plus haceute à quatre barres de distance. Kanon (in Hypodiapason) alla Ottava: Eine von vier kanonischen Fugen. Zweiteilig, mit zunächst umgekehrten Thema, das dann in seiner Grundform vorgetragen wird, aber wesentliche rhythmische Veränderungen und Figurationen aufweist. Die Fuge wird in der Oktave zu einem einfachen Kanon verarbeitet. Die Unterstimme folgt der Oberstimme im Abstand von vier Takten. Contrapunctus 5: A simple four-part fugue. Here the main theme is varied by two passing notes. Stretti are variously spaced, both straight and inverted. Contrapunctus 5: Une simple fugue à quatre parties. Ici le thème principal est varié par deux notes de passage. Les strettes sont espacées de manière variée; elles sont normales et renversées. Contrapunctus 5: Eine einfache vierstimmige Fuge. Hier wird das Hauptthema durch zwei Durchgangstöne variiert. Stretti sind vermischt in der Grund- und Umkehrungsform verteilt. Contrapunctus 6: In four parts (‘in Stylo Francese’). Once more the main theme is varied with passing notes. The response is inverted and diminished while variously-spaced stretti are straight, inverted, normal, diminished, double and triple. The theme takes on four seperate guises. Contrapunctus 6: En quatre parties («in Stylo Francese»). Le thème principal est une fois encore varié avec des notes de passage. La réponse est renversée et diminuée tandis que les strettes à espacement varié sont normales, renversées, diminuées, doubles et triples. Le thème prend quatre aspects séparés. Contrapunctus 6: Vierstimmig, („in Stylo Francese“). Wiederum wird das Hauptthema mit Durchgangstönen variiert. Die Antwort erfolgt in Umkehrung und Verkleinerung, während unterschiedlich verteilte Stretti (Engführungen) in Grundform, Umkehrung und variierten Zeitwerten auftreten. Das Thema legt sich vier verschiedene Gewänder an. Contrapunctus 7: In four parts (per Augmentationem et Diminutionem). Additional to variants of the basic theme heard so far. The exposition with its inverted response passes from bass to soprano and the augumentations are enriched by the four versions of the theme from Contrapunctus 6. Stretti occur at a variety of intervals. Contrapunctus 7: En quatre parties (per Augmentationem et Diminutionem). Il vient s’ajouter aux variantes du thème de base entendu jusqu’ici. Avec sa réponse renversée, l’exposition passe de la basse au ut1 et les augmentations sont enrichies des quatre versions du thème du Contrapunctus 6. Les strettes surviennent à divers intervalles. Contrapunctus 7: Vierstimmig (per Augmentationem et Diminutionem). Zusätze zu den bisher gehörten Varianten des Grundthemas. Die erste Durchführung gleitet mit ihrer umgekehrten Antwort vom Baß zum Sopran. Die Vergrößerungen werden durch die vier Versionen des Themas aus dem Contrapunctus 6 bereichert. Stretti treten in verschiedenen Abständen auf. Canon alla Duodecima in Contrapunto alla Quinta: In two parts. Another (straight) version of the main theme with major changes of rhythm and embellishments. Within the first section the canon is in the upper duodecima. For the second section parts are interchanged with the canon now in the double sub-octave. The upper part follows the lower at a distance of eight bars to the middle of the fugue; then the upper part leads with the lower trailing by eight bars (at the octave). Canon alla duodecima in contrapunto alla quinta: En deux parties. Une autre version (normale) du thème principal avec d’importants changements de rythme et des ornements. Dans la première section, le canon est dans l’octave supérieure. Dans la deuxième section les parties s’interchangent avec le canon maintenant dans la double sous-octave. La partie supérieure suit la partie inférieure à une distance de huit barres jusqu’au milieu de la fugue puis la partie supérieure mène tandis que l’inférieure suit de huit barres (à l’octave). Canon all Duodecima in Contrapunto alla Quinta: Dieser zweistimmige Kanon basiert ebenfalls auf dem Hauptthema, zitiert es jedoch mit bedeutenden Rhythmusänderungen und Figurationen. Im Duodezimenkanon verändert sich das Intervallverhältnis, und die Stimmen vertauschen ihre Rollen. Die Oberstimme folgt der Unterstimme in einem achttaktigen Abstand bis zur Mitte der Fuge, danach führt die Oberstimme, während die Unterstimme (in der Oktave) hinterherschleift. Contrapunctus 8: A three-part triple fugue and one of the most outwardly attractive items of the entire work. Two new themes are heard in straight configuration and reappear in contrapunctus 11. Later these themes combine with the variation of the principal theme in its inverted from. Now the main theme is inverted and rythmically diversified. Contrapunctus 8: Une triple fugue à trois parties et l’un des morceaux extérieurement les plus séduisants de toute l’œuvre. On entend deux nouveaux thèmes dans une configuration normale et ils réapparaissent dans contrapunctus 11. Plus tard ces thèmes sont combinés à la variation du thème principal dans sa forme renversée. Maintenant le thème est renversé et rythmiquement diversifié. Contrapunctus 8: Eine dreistimmige Tripelfuge und nach außen hin eine der reizvollsten des gesamten Werkes. Zwei neue Themen werden in eingeführt, die im Contrapunctus 11 wiederaufgegriffen werden. Das Stück kulminiert in der Kombination dieser Themen mit der Variante des Hauptthemas in der Umkehrungsform. Das Hauptthema erfährt durch eine neue Rhythmitisierung einen zusätzlichen Abwechslungsreichtum. Contrapunctus 9 (alla Duodecima): Following the exposition of this new theme, the main augmented theme reappears seven times at differing intervals as a fixed melodic accompaniment. On each occasion the new theme and principle theme combine in two different intervals. Contrapunctus 9 (alla Duodecima): Suite à l’exposition de ce nouveau thème, le thème principal augmenté réapparaît sept fois à différents intervalles comme un accompagnement mélodique fixe. A chaque fois le nouveau thème et le thème principal sont combinés en deux intervalles différents. Contrapunctus 9 (alla Duodecima): Nach der Exposition dieses neuen Themas tritt das vergrößerte Hauptthema siebenmal als feststehende Melodienbegleitung in unterschiedlichen Intervallen hinzu. Jedesmal werden das neue und das Hauptthema in zwei Intervallkonstellationen kombiniert. Contrapunctus 10 (alla Decima): Another new theme is introduced. Its shift from straight to inverted form occurs after the exposition. Bar 23 brings a second exposition. This time passing notes serve to vary the inverted main theme. There is also a vital new counter-subject. The two themes are combined after bar 44 while passages of thirds and sixths further enliven both themes. Contrapunctus 10 (alla Decima): Introduction d’un autre thème nouveau. Il passe de la forme normale à la forme renversée après la première exposition. La 23ème barre amène une deuxième exposition. Cette fois-ci des notes de passage servent à varier le thème principal renversé. Il y a aussi un nouveau contre-sujet vital. Les deux thèmes sont combinés après la 44ème barre tandis que des passages de tierces et de sixtes viennent encore animer les deux thèmes. Contrapunctus 10 (alla Decima): Ein neues Thema wird vorgestellt. Es wechselt unmittelbar nach seiner Aufstellung von der Grund- in die Umkehrungsform. In Takt 23 wird das zweite Thema eingeführt. Diesmal ist die Aufgabe der Durchgangstöne, das umgekehrte Hauptthema zu variieren. Ein neues und bedeutendes Gegenthema tritt ebenfalls hinzu. Die beiden Thema werden ab Takt 44 kombiniert und von Terz- und Sext-Passagen belebt. Contrapunctus 11: A four-part triple fugue. It begins with a variation of the rythmically altered principal theme (cf. the inverted form at Contrapunctus 8). The themes combine and recombine in both straight and inverted form; eight themes in all. This complex equation includes an ascending/descending chromatic line regarded as the fourth theme. Contrapunctus 11: Une triple fugue à quatre parties. Elle commence par une variation du thème principal rythmiquement modifié (cf. la forme renversée au Contrapunctus 8). Les thèmes sont combinés et recombinés en forme normale et renversée; huit thèmes en tout. Cette équation complexe englobe une ligne chromatique ascendante/descendante considérée comme le quatrième thème. Contrapunctus 11: Eine vierstimmige Tripelfuge. Sie beginnt mit einer Variation des rhythmisch veränderten Hauptthemas (vgl. die Umkehrungsform in Contrapunctus 8). Die Themen werden in der Grundform und der Umkehrung kombiniert und wieder kombiniert, bis sie insgesamt acht Themen bilden. In diese komplexe Gleichung wird auch eine auf-/absteigende chromatische Linie, die als das vierte Thema zu verstehen ist, aufgenommen. Canon (in Hypodiatessaron) per Augmentationem in Contrario Motu: A daring variation on the basic outline of the theme. Its lower part follows the upper in augmented inversion at four bars’ distance. The latter half has this same canon. But now, from mid-way its parts are interchanged. Canon (en quarte plagale) per Augmentationem in Contrario Motu: Une variation audacieuse du contour de base du thème. Sa partie inférieure suit la partie supérieure par renversement augmenté à quatre barres de distance. La dernière moitié a le même canon. Mais maintenant et à partir du milieu, ses parties s’interchangent. Canon (in Hypodiatessaron) per Augmentationem in Contrario Motu: Eine gewagte Variation der Grundzüge des Hauptthemas. Die Unterstimme folgt der Oberstimme in vergrößerter Umkehrung im Abstand von vier Takten. Die zweite Hälfte enthält denselben Kanon, nur diesmal mit ab Mitte des Stückes vertauschten Stimmen. Canon alla decima 'Contrapunto alla terza': Bach’s technique repeats that on. Again there are two parts with the main theme changed. The fugue starts out as a canon at the tenth (upper decima). It is changed mid-way, becoming a canon at the sub-octave. The crux of this fugue is its simple, syncopated inversion. Canon alla Decima (Contrapunto alla Terza): La technique de Bach le reprend sur la piste. Ici encore nous avons deux parties avec un thème principal modifié. La fugue commence en canon à la dixième (supérieure). Elle se transforme à mi-chemin en un canon à la sous-octave. Le point central de cette fugue est son simple renversement syncopé. Canon alla Decima (Contrapunto alla Terza): Eine Wiederholung der auf dargestellten Bachschen Technik. Wiederum zweistimmig, mit verändertem Hauptthema. Die Fuge beginnt als Dezimenkanon, bis sie auf halbem Weg zum Suboktavenkanon wird. Den Kern dieser Fuge bildet ihre einfache, synkopierte Umkehrung. Contrapunctus 13 (Rectus): A mirror fugue in three parts. The simple, basic form of the theme is constantly changed, embellished and inverted. Its non-thematic bass remains exempt. Both mirror fugues are extended for two harpsichords where required. Contrapunctus 13 (Rectus): Une fugue miroir à trois parties. La simple forme de base du thème est constamment modifiée, ornée et renversée. Sa basse non thématique demeure inchangée. Les deux fugues miroirs sont prolongées pour deux clavecins si désiré. Contrapunctus 13 (Rectus): Eine dreistimmige Spiegelfuge. Die einfache Grundform des Themas wird ständig verändert, figuriert und umgekehrt. Die Baßstimme bleibt an diesem Themenvortrag unbeteiligt. Für beide Spiegelfugen gibt es eine Bearbeitung für 2 Cembali. Contrapunctus 13 (Inversus): A complete (mirror) inversion of the preceding Rectus. The middle section of the former becomes the upper part. By the same token the lower part takes the middle, and the upper part is bass of the Inversus. Contrapunctus 13 (Inversus): Un renversement complet (miroir) du Rectus précédent. La section centrale du morceau précédent devient la partie supérieure. Il s’ensuit que la partie inférieure occupe le centre et la partie supérieure est la partie basse de l’Inversus. Contrapunctus 13 (Inversus): Eine vollständige Umkehrung (Spiegelung) der vorangegangenen Rectus-Form. Der Mittelteil der ersteren wird in der Inversus-Form zur Oberstimme, während die Unterstimme in die Mitte gleitet und die Oberstimme nun die Baßstimme ist. Contrapunctus 12 (Rectus): A mirror fugue in four parts. Its simple, main theme is inverted, varied and embellished in all four parts. A second variant of the theme follows. Contrapunctus 12 (Rectus): Une fugue miroir à quatre parties. Son thème principal simple est renversé, varié et orné dans les quatre parties. Une deuxième variante du même thème suit. Contrapunctus 12 (Rectus): Eine vierstimmige Spiegelfuge. Ihr schlichtes Hauptthema wird in allen vier Stimmen umgekehrt, variiert und figuriert. Es folgt eine zweite Variante des Themas. Contrapunctus 12 (Inversus): The entire four-part fugue is mirrored with its bass becoming the soprano and so forth. Now the total inversion has its own autonomous validity. In our present century Fricker welds the mirror and its image (12 Studies for Piano) while Bartók’s ‘Chromatic Inversion’ (Mikrokosmos VI) allows for simultaneous or successive images on two pianos. Contrapunctus 12 (Inversus): La fugue entière à quatre parties est reflétée, la basse devenant la clef d’ut et ainsi de suite. Maintenant le renversement total a sa propre validité autonome. Au vingtième siècle, Fricker a soudé le miroir et son image (12 Etudes pour piano) tandis que le «Renversement chromatique» de Bartók (Mikrokosmos VI) autorise les images simultanées ou successives sur deux pianos. Contrapunctus 12 (Inversus): Diese vierstimmige Fuge wird in ihrer Gesamtheit gespiegelt, d.h. Baß wird zum Sopran usw., und die ganze Umkehrung erlangt ihre autonome Gültigkeit. Im 20. Jahrhundert machte Fricker von der Spiegelung Gebrauch (12 Studien für Klavier), während Bartoks „Chromatische Umkehrung“ (Mikrokosmos VI) auf zwei Klavieren gleichzeitige oder aufeinanderfolgende Bilder entwirft. Contrapunctus 14: In this final triple fugue Bach chose to include the letters of his own name (B = B flat and H = B natural in German nomenclature). In this way he set his personal seal on the work as a whole. The first deliberate, ricercare-like theme reads the same whether backward or forwards. It is heard in stretto and in inversion. The second theme, principally in quavers, eventually combines with the first. The third (final) theme turns to the B-A-C-H motif, presented in minims. After a brief passage of counterpoint the print ends while the autograph continues for another seven bars. Hearing the BACH theme, the instant of unison with all three themes, then abrupt and sudden silence, gives the work a final shattering impact. Contrapunctus 14: Dans cette triple fugue finale, Bach décida d’inclure les lettres de son nom (selon la notation allemande). Il appose donc son sceau personnel à l’œuvre complète. Le premier thème délibéré en ricercare se lit de la même façon dans les deux sens. On l’entend en strette et en forme renversée. Le deuxième thème essentiellement en croches, finit par se combiner au premier. Le troisième thème (final) se tourne vers le motif B-A-C-H, présenté en blanches. Après un passage bref en contrepoint, l’édition se termine tandis que le manuscrit continue sur sept barres de plus. Entendre le thème de BACH, l’instant d’unisson avec les trois thèmes, puis le silence brutal et soudain, donne à l’œuvre un effet final foudroyant. Contrapunctus 14: In diese letzte Tripelfuge hat Bach die Tonfolge B-A-C-H aufgenommen und damit sein Siegel unter das Werk gesetzt. Das erste bedächtige, ricercar-ähnliche Thema liest sich vor- wie rückwärts gleich. Es erklingt in Engführung und Umkehrung. Das zweite, hauptsächlich in Achteln vorgestellte Thema, wird schließlich mit dem ersten kombiniert. Das dritte und letzte Thema beginnt mit der Tonfolge B-A-C-H in halben Noten. Nach einer kurzen Kontrapunktpassage bricht die Druckversion ab, während das Autograph noch weitere sieben Takte enthält. Das BACH-Thema, die unmittelbare Vereinigung mit allen drei Themen und dann abruptes und plötzliches Schweigen verleihen dem Werk seine letzte und erschütternde Wirkung. Contrapunctus 1: For a work that is so complicated, Bach could not have chosen a simpler beginning. There are no fugal games in the first contrapunctus, only entries of the subject (as indeed is the case with the first four contrapuncti). Ties and syncopated rhythms play a big role in the accompanying material, but there is no formal counter-subject. We have one overlapping entry at bar 32 (1'15—note how Bach always includes the tail of the subject, those final four descending notes, something he never neglects to do in the whole Art of Fugue); one false entry in the alto in bar 48 (1'51); a pedal point at bar 63 leading to a quasi-cadenza-like passage with dramatic pauses (2'24); and the final entry of the subject in the tenor over an extended pedal point 2'53). These last five bars were an afterthought and didn’t exist in the original version. Much of the episodic material has the same up-and-down movement (for instance in bars 17–23 (0'40–0'54) and 44–49 (1'42–1'53)), giving it a beautiful sense of line, and allowing for satisfying breathing spaces between entries. The mood is lyrical and expressive. Contrapunctus 1: Pour une œuvre aussi compliquée, Bach n’aurait pu choisir un début plus simple. Il n’y a aucun jeu fugué dans le premier contrapunctus, uniquement des entrées du sujet (comme c’est en fait le cas dans les quatre premiers contrapuncti). Les liaisons et les rythmes syncopés jouent un grand rôle dans le matériel d’accompagnement, mais il n’y a pas de contre-sujet formel. On a une entrée qui chevauche la précédente à la mesure 32 (à 1'15—noter comment Bach inclut toujours la queue du sujet, ces quatre dernières notes descendantes, ce qu’il n’omet jamais de faire dans tout L’Art de la fugue); une fausse entrée à l’alto à la mesure 48 (1'51); une pédale à la mesure 63 menant à un passage qui ressemble presque à une cadence avec des silences dramatiques (2'24); et l’entrée finale du sujet à la partie de ténor sur une pédale prolongée (2'53). Ces cinq dernières mesures ont été ajoutées après coup et n’existaient pas dans la version originale. Une grande partie du matériel épisodique a le même caractère en dents de scie (par exemple aux mesures 17–23 (0'40–0'54) et 44–49 (1'42–1'53)), ce qui lui donne un magnifique sens de la ligne et permet des répits salutaires entre les entrées. L’atmosphère est lyrique et expressive. Contrapunctus 1: Für ein so komplexes Werk hätte Bach keinen schlichteren Beginn wählen können. Im ersten Contrapunctus finden keine technischen Spiele, sondern nur Themeneinsätze statt (so verhält es sich auch in den folgenden drei Contrapuncti). Überbindungen und Synkopierungen spielen hier in dem Begleitmaterial eine wichtige Rolle, doch gibt es kein formales Kontrasubjekt. In Takt 32 gibt es einen überlagernden Einsatz (1'15—man beachte, dass Bach in der gesamten Kunst der Fuge den Themenanhang, die letzten vier absteigenden Töne, stets mit einschließt); in Takt 48 (1'51) erklingt in der Altstimme ein unvollständiger Themeneinsatz; ein Orgelpunkt in Takt 63 leitet zu einer kadenzartigen Passage mit dramatischen Pausen hinüber (2'24) und der letzte Themeneinsatz im Tenor erfolgt über einem ausgedehnten Orgelpunkt (2'53). Diese letzten fünf Takte waren ein nachträglicher Einfall und existierten in der Originalversion nicht. Das episodische Material hat zum größten Teil jene auf- und absteigende Bewegungsrichtung (so etwa in Takt 17–23 (0'40–0'54) und 44–49 (1'42–1'53)), was für eine sehr schöne musikalische Linie sorgt und Atempausen zwischen den Einsätzen erlaubt. Die Atmosphäre ist lyrisch und expressiv. Contrapunctus 2: By the simple addition of some dotted notes to the tail of the subject, Bach completely alters the character of his theme. By continuing this dotted rhythm throughout the entire contrapunctus, he gives us a piece that really has some swing! At the beginning he slurs each group of four notes in this dotted rhythm. To me this has always meant that they should not be interpreted as notes inégales (in the French manner) but played exactly as written. I don’t think it means you have to play them completely legato. Especially when there is a tie to the next group (as in bar 5 in the left hand—0'08), a slight lift before the syncopated note makes the whole thing a bit jazzier. Not surprisingly, this dotted tail forms the basis of all the accompanying material. In bar 44 (1'16) we have an ascent into the subject in the soprano, presented in F major, changing the colour in a very attractive way. The entrance in the bass in bar 61 (1'46), having found itself back in the key of D minor, needs special emphasis. The tenor in bar 69 (2'00) presents its subject off the beat, gradually finding its way back home. It is interesting that in the original Berlin autograph, the piece ends in the dominant at bar 78 (2'16). It is then followed by what we know today as Contrapunctus 5. As Tovey points out, this must mean that Bach envisaged at least some of the work being performed in sequence. Contrapunctus 2: Par le simple ajout de quelques notes pointées à la queue du sujet, Bach modifie complètement le caractère de son thème. En poursuivant ce rythme pointé dans la totalité du contrapunctus, il nous donne un morceau qui est vraiment rythmé! Au début, il lie chaque groupe de quatre notes dans ce rythme pointé. Pour moi, cela a toujours signifié qu’elles ne doivent pas être interprétées comme des «notes inégales» (à la manière française) mais jouées exactement telles qu’elles sont écrites. Je ne pense pas que cela implique qu’il faille les jouer entièrement legato. Surtout lorsqu’il y a une liaison avec le groupe suivant (comme à la mesure 5 à la main gauche—0'08), lever légèrement le doigt avant la note syncopée rend le tout un peu plus jazzy. Cette queue pointée forme la base de tout le matériel d’accompagnement, ce qui n’est pas étonnant. À la mesure 44 (1'16), on a une montée vers le sujet à la partie de soprano, présenté en fa majeur, ce qui change la couleur d’une manière très séduisante. L’entrée à la basse à la mesure 61 (1'46) se retrouvant dans la tonalité de ré mineur ne nécessite aucune accentuation particulière. La partie de ténor à la mesure 69 (2'00) présente son sujet à contre-temps avant de retrouver peu à peu son cheminement naturel. Il est intéressant que dans l’autographe original de Berlin, le morceau s’achève à la dominante à la mesure 78 (2'16). Il est alors suivi de ce que l’on appelle aujourd’hui le Contrapunctus 5. Comme le souligne Tovey, cela signifie que Bach envisageait qu’au moins une partie de l’œuvre soit jouée par séquences. Contrapunctus 2: Lediglich durch das Hinzufügen mehrerer punktierter Töne an den Themenanhang verändert Bach den Charakter seines Themas völlig. Er fährt mit diesem punktierten Rhythmus durch den gesamten Contrapunctus hindurch fort und erzeugt damit echten Swing! Zu Beginn fasst er die Vierergruppen dieses punktierten Rhythmus mit Bögen zusammen. Ich habe das immer so verstanden, dass sie nicht wie in französischer Manier als notes inégales aufgefasst, sondern genauso gespielt werden sollten, wie sie notiert sind. Ich glaube nicht, dass sie völlig legato gespielt werden müssen. Besonders wenn es eine Überbindung in die nächste Gruppe gibt (wie in Takt 5 in der linken Hand—0'08), lässt ein kleines Anheben vor der Synkope das Ganze etwas jazziger erscheinen. Es ist nicht weiter überraschend, dass dieser punktierte Themenanhang die Grundlage für das Begleitmaterial bildet. In Takt 44 (1'16) findet ein Aufstieg in das Thema in der Sopranlage statt und es wird in F-Dur präsentiert, was für einen sehr schönen klangfarblichen Wechsel sorgt. Der Einsatz im Bass in Takt 61 (1'46)—zurück in d-Moll—muss betont werden. Der Tenor präsentiert in Takt 69 (2'00) sein Thema gegen den Takt und findet allmählich heim. Es ist interessant, dass das Werk im originalen Berliner Manuskript auf der Dominante in Takt 78 (2'16) endet. Darauf folgt dann das Stück, welches wir heute als Contrapunctus 5 kennen. Wie Tovey bereits angemerkt hat, muss dies wohl bedeuten, dass Bach geplant hatte, dass zumindest einige Stücke des Werks in Folge gespielt werden sollten. Contrapunctus 3: The third contrapunctus is a beautifully expressive piece. Quietly assured, chromatic and very vocal in character, it was originally placed second in the cycle. By changing it to third position and inserting Contrapunctus 2, Bach gives us the chance to alternate moods more effectively. It presents the subject only in its inversion, now accompanied by a chromatic counter-subject, crawling up and down. Unusually he inserts a two-bar episode (bars 13–14; 0'30–0'34) before the last entrance of the subject in the exposition. The subsequent episode (bars 19–22; 0'44–0'53) has the upper two voices exchanging motifs while the bass provides accompaniment. A variation of this same episode will be repeated in bars 39–42 (1'31–1'41), providing a nice symmetry. In bar 23 (0'53) we have the first appearance of an ornamented version of the subject using syncopation and passing notes. Its third appearance in F major (bar 35 in the tenor—1'21) adds some beautiful warmth to the harmony. From then on, the ornamented version is presented alongside its original. The fugue takes six bars to wind down after the final entrance of the subject. In its original version there were only four bars at this point, the piece ending in bar 70 (2'44). Bach really knew how to improve things even more. Contrapunctus 3: Le troisième contrapunctus est une pièce merveilleusement expressive. De caractère discrètement assuré, chromatique et très vocal, il occupait à l’origine la deuxième place dans le cycle. En le plaçant en troisième position et en insérant le Contrapunctus 2, Bach nous donne l’occasion de varier les atmosphères de manière plus frappante. Il présente le sujet uniquement dans son inversion, maintenant accompagné d’un contre-sujet chromatique, montant et descendant lentement. Chose rare, il insère un épisode de deux mesures (mesures 13–14; 0'30–0'34) avant la dernière entrée du sujet dans l’exposition. Dans l’épisode suivant (mesures 19–22; 0'44–0'53), les deux voix supérieures échangent des motifs pendant que la basse fournit l’accompagnement. Une variation du même épisode sera répétée aux mesures 39–42 (1'31–1'41), ce qui procure une belle symétrie. À la mesure 23, on a la première apparition d’une version ornementée du sujet utilisant la syncope et des notes de passage (0'53). Sa troisième apparition en fa majeur (mesure 35 au ténor—1'21) ajoute beaucoup de chaleur à l’harmonie. Dès lors, la version ornementée est présentée à côté de son original. La fugue touche à sa fin six mesures après la dernière entrée du sujet. Dans sa version originale, il n’y avait que quatre mesures à cet endroit, le morceau s’achevant à la mesure 70 (2'44). Bach savait vraiment comment améliorer les choses. Contrapunctus 3: Der dritte Contrapunctus ist ein wunderbar expressives Stück. Ruhig und selbstsicher angelegt, chromatisch und sehr sangbar im Charakter, stand es ursprünglich an zweiter Stelle in dem Zyklus. Indem er es an die dritte Stelle verlegte und den Contrapunctus 2 einfügte, gibt uns Bach die Gelegenheit, die Stimmungen wirksamer miteinander zu alternieren. Hier wird das Thema nur in der Umkehrung präsentiert und nun von einem chromatischen Kontrasubjekt begleitet, das sich hoch und wieder herunter bewegt. Vor dem letzten Themeneinsatz in der Exposition fügt er ein zweitaktiges Zwischenspiel (Takt 13–14; 0'30–0'34) ein, was ungewöhnlich ist. Im nächsten Zwischenspiel (Takt 19–22; 0'44–0'53) tauschen die oberen beiden Stimmen die Motive aus, während der Bass für die Begleitung sorgt. Eine Variation dieses Zwischenspiels wird in den Takten 39–42 wiederholt (1'31–1'41), was für eine hübsche Symmetrie sorgt. In Takt 23 (0'53) kommt die verzierte Version des Themas zum ersten Mal zum Vorschein, wobei von Synkopen und Durchgangstönen Gebrauch gemacht wird. Wenn es das dritte Mal in F-Dur (Takt 35 im Tenor—1'21) erklingt, erhält die Harmonie dadurch eine besonders schöne Wärme. Von da an wird die verzierte Version neben der ursprünglichen präsentiert. Die Fuge benötigt sechs Takte, um nach dem letzten Themeneinsatz zur Ruhe zu kommen. In der Originalversion standen an dieser Stelle nur vier Takte, so dass das Stück in Takt 70 endete (2'44)—Bach verstand sich wirklich darauf, seine Werke noch zu verbessern. Contrapunctus 4: Contrapunctus 4 is one of the best fugues in the whole cycle. It didn’t exist in the early version, so it must have been written in Bach’s final years. The subject is again inverted, this time with its initial entry starting on the dominant A instead of the tonic D. The episodes are mainly based on two motifs: that four-note tail is everywhere—right way up and upside down; and along with it, often combined together (such as in the episodes which begin at bar 53 (1'38) and bar 103 (3'10)), is what Tovey calls a ‘cuckoo-like figure of a descending third’, which Bach inverts in bar 69 (2'07), turning it into a leap of a sixth. Special attention must be given to an enhanced form of the subject beginning with the entry in bar 61 (1'53). The fifth note is pushed up a step, bringing about a series of modulations that peaks at bar 79 with the G natural in the soprano (2'26). Pop music picked up that trick long ago. Knowing he couldn’t outdo that for a while, Bach then gives us an episode that lasts an amazing 26 bars (bars 81–107; 2'29–3'17). He has one more trick up his sleeve in this tremendous fugue, even though he still doesn’t allow any serious games. Beginning at bar 107 (3'17), the subject is presented in syncopated doubling—first in the lower voices in thirds, and then answered by the upper ones in sixths. One more enhanced subject in the tenor voice is followed by the original in D minor in the alto, bringing this fugue to a perfect close. The tempo should be more flowing than the preceding fugue, not solely as a contrast but because a lot of the material (especially the episode beginning at bar 53 (1'38), for instance) demands it. Contrapunctus 4: Le Contrapunctus 4 est l’une des meilleures fugues de tout le cycle. Il n’existait pas dans la première version et Bach a donc dû l’écrire à la fin de sa vie. Le sujet est à nouveau inversé, cette fois avec son entrée initiale débutant à la dominante, la, au lieu de la tonique, ré. Les épisodes reposent principalement sur deux motifs: cette queue de quatre notes omniprésente—dans le bon sens et à l’envers. En même temps et souvent associée à elle (comme dans les épisodes qui commencent à la mesure 53 (1'38) et à la mesure 103 (3'10)), se trouve ce que Tovey appelle une «figure de tierce descendante qui fait penser à un coucou», que Bach inverse à la mesure 69 (2'07) pour la transformer en un saut d’une sixte. Il faut accorder une attention particulière à une forme augmentée du sujet qui commence avec l’entrée de la mesure 61 (1'53). La cinquième note est un degré plus haut, entraînant une série de modulations qui culminent à la mesure 79 avec le sol naturel à la partie de soprano (2'26). La musique pop a repris cette astuce depuis longtemps. Sachant qu’il ne pouvait faire mieux que cela pendant quelque temps, Bach nous donne alors un épisode qui, chose incroyable, dure 26 mesures (mesures 81–107; 2'29–3'17). Dans cette formidable fugue, il a encore un tour dans son sac, même s’il n’autorise encore aucun jeu sérieux. À partir de la mesure 107 (3'17), le sujet est présenté en doublure syncopée—tout d’abord aux voix graves à la tierce, auxquelles répondent ensuite les voix supérieures à la sixte. Un autre sujet augmenté à la voix de ténor est suivi de l’original en ré mineur à la voix d’alto, menant cette fugue à une fin parfaite. Le tempo doit être plus fluide que dans la fugue précédente, non seulement pour opérer un contraste, mais parce qu’une grande partie du matériel l’exige (en particulier l’épisode de la mesure 53 (1'38), par exemple). Contrapunctus 4: Contrapunctus 4 ist eine der besten Fugen des gesamten Zyklus. In der frühen Version existierte sie nicht, muss also in Bachs letzten Lebensjahren komponiert worden sein. Das Thema ist wiederum umgekehrt, diesmal mit dem ersten Einsatz auf der Dominante A anstatt der Tonika D. Den Zwischenspielen liegen hauptsächlich zwei Motive zugrunde; der Vierton-Themenanhang, der überall anzutreffen ist, sowohl richtig herum als auch auf den Kopf gestellt. Daneben, und zusammen kombiniert (wie etwa in den Zwischenspielen, die jeweils in Takt 53 (1'38) und Takt 103 (3'10) beginnen), erklingt—in Toveys Worten—eine „kuckucksartige Figur einer fallenden Terz“, die Bach in Takt 69 (2'07) umkehrt, so dass sich ein Sextsprung ergibt. Besondere Beachtung muss dem erweiterten Thema geschenkt werden, das in Takt 61 (1'53) einsetzt. Der fünfte Ton ist um eine Stufe nach oben verlegt, was eine Reihe von Modulationen mit sich bringt, die in Takt 79 auf dem G im Sopran ihren Höhepunkt erreichen (2'26). In der Popmusik ist dieser Trick schon seit Langem verbreitet. Bach war sich darüber bewusst, dass er dies erstmal nicht überbieten konnte, so dass er dann ein Zwischenspiel folgen ließ, welches ganze 26 Takte lang ist (Takt 81 bis 107; 2'29–3'17). Dann wartet er in dieser gewaltigen Fuge mit einem weiteren Trick auf, obwohl er sich kompliziertere Spielereien immer noch versagt. Ab Takt 107 (3'17) wird das Thema in synkopierter Verdopplung vorgestellt—zunächst in den Unterstimmen in Terzen, was dann von den Oberstimmen in Sexten beantwortet wird. Auf das nächste erweiterte Thema in der Tenorstimme folgt das Original in d-Moll in der Altstimme, womit diese Fuge zum perfekten Abschluss gebracht wird. Das Tempo sollte hier fließender sein als in der vorangehenden Fuge, nicht nur als Kontrast, sondern auch, weil ein großer Teil des musikalischen Materials (insbesondere das Zwischenspiel in Takt 53—1'38) es verlangt. Contrapunctus 5: Now the fun begins. Contrapunctus 5 uses a variant of the subject (which includes passing notes but no syncopation), presenting it in both the original and inverted forms. The tempo needs to be flowing but not hurried in order to sing all the parts well. At bar 33 (1'05) Bach introduces his first stretto of The Art of Fugue, and he begins with a close one: in contrary motion, the soprano enters one beat after the bass. You can see why he chose the variant with the passing notes for this initial stretto. The part-writing is so smooth and perfect—anything but stilted. Two more pairs of stretti enter, bringing us to the first of two ‘mirror’ episodes (bar 53; 1'46). Here the initial part of the subject is used in a four-part canon, at an even closer distance than the first stretto since the opening note is shortened in length. It is very ingenious and very much in the style of old-fashioned vocal counterpoint. Another stretto, this time not in contrary motion, has its tail lead us downwards to a close in the dominant. Then at bar 65 (2'10) we have the mirror image of the episode at bar 53. 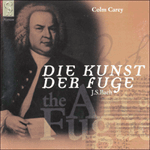 For the final five bars of this fugue (2'51) Bach expands the texture to six voices and gives us simultaneous entries of the subject in mirror image over a tonic pedal and tierce de Picardie (i.e. a cadence in the tonic major). Contrapunctus 5: C’est alors qu’on commence à s’amuser. Le Contrapunctus 5 utilise une variante du sujet (avec des notes de passage mais pas de syncopes), qui le présente à la fois sous sa forme d’origine et inversée. Le tempo est fluide mais pas précipité afin de bien chanter toutes les parties. À la mesure 33 (1'05), Bach introduit sa première strette de L’Art de la fugue et il commence par une strette où les entrées sont rapprochées: en mouvement contraire, la voix de soprano entre un temps après la basse. On comprendra aisément pourquoi il choisit la variante avec les notes de passage pour cette strette initiale. La conduite des voix est fluide et parfaite—tout sauf guindée. Deux autres paires de strettes font leur entrée, nous amenant au premier des deux épisodes «en miroir» (mesure 53; 1'46). Ici, la partie initiale du sujet est utilisée dans un canon à quatre voix encore plus serré que dans la première strette car la durée de la première note est raccourcie. C’est très ingénieux et tout à fait dans le style du contrepoint vocal à l’ancienne. La queue d’une autre strette, qui n’est pas en mouvement contraire cette fois, nous mène en descendant vers une conclusion à la dominante. Puis, à la mesure 65 (2'10), nous avons l’image en miroir de l’épisode de la mesure 53. Pour les cinq dernières mesures de cette fugue (2'51), Bach élargit à six voix et nous donne des entrées simultanées du sujet en miroir sur une pédale de tonique avec une tierce de Picardie (c’est-à-dire une cadence à la tonique majeure). Contrapunctus 5: Hier kommt Freude auf. Im Contrapunctus 5 wird eine Variante des Themas (mit Durchgangstönen, allerdings ohne Synkopen) verwendet und sowohl in originaler als auch umgekehrter Form präsentiert. Das Tempo fließt, aber eilt nicht, so dass alle Stimmen sangbar durchgestaltet werden können. In Takt 33 (1'05) wartet Bach mit seiner ersten Engführung in der Kunst der Fuge auf, und diese ist besonders eng gehalten. Es setzen Sopran und Bass in Gegenbewegung ein, wobei der Sopran einen Schlag nach dem Bass erklingt. Dabei wird deutlich, weshalb er sich bei dieser Engführung für die Variante mit den Durchgangstönen entschied. Die Stimmführung ist geschmeidig und perfekt—alles andere als gestelzt. Es folgen zwei weitere Engführungen und es erklingt das erste von zwei „Spiegel“-Zwischenspielen (Takt 53; 1'46). Hier wird der erste Thementeil in einem vierstimmigen Kanon mit einem noch kleineren Abstand als in der ersten Engführung verarbeitet, da hier der erste Ton eine kürzere Dauer hat—genialer Tonsatz, der im Stil des altmodischen vokalen Kontrapunkt gehalten ist. In einer weiteren Engführung, diesmal nicht in Gegenbewegung, ist der Themenanhang nach unten gerichtet, so dass es zu einem dominantischen Schluss kommt. In Takt 65 (2'10) kommt dann das Spiegelbild des Zwischenspiels von Takt 53. In den letzten fünf Takten dieser Fuge erweitert (2'51) Bach den Satz auf sechs Stimmen und lässt gleichzeitige Themeneinsätze in gespiegelter Form über einem Tonika-Orgelpunkt und einer picardischen Terz (also eine Kadenz in der Durtonika) erklingen. Contrapunctus 6 ‘in stylo Francese’: Contrapunctus 6 is a hard nut to crack. Not only do you have to deal with a very dense stretto fugue with inversions and diminutions piled on top of each other, but you also shouldn’t play exactly what is written in the score. Bach gives this piece the subtitle ‘in stylo Francese’, meaning that the rhythmic alterations so loved by the French should be adopted. In the opening four bars, for example, I play the first entry in the bass as written (I tried double-dotting it but for me this didn’t work—it led to all sorts of complications that didn’t make sense), but I double-dot the diminished version in the soprano, and then in the alto. This means that the two Gs in the right hand at the end of the third bar do not fall together (0'11). Now apply that to all 79 bars (over six pages) and you’ll see what I mean! Some ornamentation is also necessary, as well as notes inégales and proper articulation (tiny lifts in the right places). The demisemiquaver flourish that first appears at the end of bar 7 (0'25) is typical of the French manner and needs to be shortened even further. Once you have mastered the note values and sorted out all the entries, you still need to make sense of the fugue as a whole and find its road plan. The amazing thing is that the first closure in the piece comes only at the very end, and not before. If the whole fugue were played in the same dynamic range it would be boring beyond belief. Finding points where the sound needn’t be forced (such as bars 20 (1'14) and 62 (3'57), to take just two examples) is crucial for the overall impact. Contrapunctus 6 is terrifying in its magnificence, and is perhaps the one point in The Art of Fugue where I wish my piano were instead an organ. Contrapunctus 6 «in stylo Francese»: Le Contrapunctus 6 n’est pas un petit problème. Non seulement vous avez à gérer une fugue strette très dense avec des inversions et des diminutions empilées les unes sur les autres, mais en outre il ne faut pas jouer exactement ce qui est écrit sur la partition. Bach donne à ce morceau le sous-titre «in stylo Francese», signifiant qu’il faut adopter les altérations rythmiques chères aux Français. Dans les quatre premières mesures, par exemple, je joue la première entrée à la basse telle qu’elle est écrite (j’ai essayé en notes doublement pointées, ce qui à mon avis ne fonctionne pas—cela induit toute sorte de problèmes qui n’ont aucun sens), mais je joue en notes doublement pointées la version diminuée à la partie de soprano puis à la partie d’alto. Cela signifie que les deux sol à la main droite à la fin de la troisième mesure ne tombent pas ensemble (0'11). Appliquez ça aux 79 mesures (courant sur six pages) et vous verrez ce que je veux dire! Une certaine ornementation s’impose ainsi que les notes inégales et une bonne articulation (lever légèrement les doigts aux bons endroits). Les ornements en triples croches qui apparaissent tout d’abord à la fin de la mesure 7 sont typiques du style français et ont besoin d’être encore plus serrés (0'25). Une fois maîtrisées les valeurs des notes et triées toutes les entrées, il faut encore comprendre la fugue dans son ensemble et trouver son plan de route. Ce qui est incroyable c’est que la première véritable conclusion dans cette pièce ne survient qu’à la toute fin, et pas avant. Si l’ensemble de la fugue était joué dans les mêmes nuances, ce serait d’un ennui insupportable. Pour son impact général, il est essentiel de trouver les endroits où le son ne doit pas être forcé (comme aux mesures 20 (1'14) et 62 (3'57) pour ne prendre que deux exemples). Le Contrapunctus 6 est terrifiant dans sa magnificence et c’est peut-être le seul endroit dans L’Art de la fugue où je souhaiterais que mon piano soit plutôt un orgue. Contrapunctus 6 „in stylo Francese“: Der Contrapunctus 6 ist eine harte Nuss. Man muss sich einerseits mit einer sehr dicht gearbeiteten Fuge mit Engführungen, Umkehrungen und Diminutionen zuhauf auseinandersetzen, und andererseits kann der Notentext auch nicht einfach abgespielt werden. Bach gibt diesem Stück den Untertitel „in stylo Francese“, was bedeutet, dass hier die rhythmischen Alterationen, die in Frankreich so beliebt waren, verwendet werden sollten. In den ersten vier Takten spiele ich zum Beispiel den ersten Einsatz im Bass, wie er notiert ist (ich habe ihn mit doppelten Punktierungen ausprobiert, mich aber dagegen entschieden, da dies zu diversen Komplikationen führte, die mir vom Komponisten nicht beabsichtigt schienen), allerdings spiele ich die verkleinerte Version in der Sopran- und dann in der Altstimme mit Doppelpunktierungen. Das bedeutet, dass die beiden Gs in der rechten Hand am Ende des dritten Takts nicht zusammenfallen (0'11). Wenn man das nun konsequent in den 79 Takten des Stücks (über sechs Seiten hinweg) durchhält, wird deutlich, was ich meine! Zudem sind auch gewisse Ausschmückungen, notes inégales und richtige Artikulation (geringes Anheben an entsprechenden Stellen) nötig. Die Zweiunddreißigstelfigur, die erstmals am Ende von Takt 7 erscheint (0'25), ist typisch für den französischen Stil und muss sogar noch mehr verkürzt werden. Wenn man einmal die Notenwerte und Einsätze geklärt hat, muss man immer noch die Fuge als Ganzes begreifen und sich eine Interpretation erarbeiten. Das Erstaunliche dabei ist, dass der erste Abschluss des Stücks sich erst ganz am Ende ereignet, und nicht schon früher. Wenn die gesamte Fuge im selben dynamischen Bereich gespielt würde, wäre sie unglaublich langweilig. Es ist daher sehr wichtig, die Punkte zu finden, wo der Klang nicht erzwungen werden muss (so etwa Takt 20 (1'14) und 62 (3'57), um nur zwei Beispiele zu nennen), so dass der Gesamteffekt entsprechend zur Wirkung kommt. Der Contrapunctus 6 ist furchterregend in seiner Pracht, und vielleicht ist dies die Stelle in der Kunst der Fuge, wo ich mir eine Orgel anstelle meines Klaviers wünsche. Contrapunctus 7 ‘per augmentationem et diminutionem’: For this next contrapunctus, Bach has a grand plan. Besides presenting the subject in its regular and diminished forms, he also uses it for the first time in augmentation, taking eight bars to get through it. The augmented subject begins in bar 5 in the bass (0'19), and then works its way upwards to the tenor (bar 23; 1'37), the alto (bar 35; 2'29), and finally to the soprano (bar 50; 3'30), where it sings out triumphantly. Above, below and in between those entries, the other three parts are engaged in a constant exchange and stretto of the subject in its other forms, including a double diminution (first heard in the soprano in the second half of bar 7—0'30). There is only one three-bar episode in the entire 61-bar fugue (bars 32–34; 2'14). I choose to keep the opening very quiet for some time, because it is a long way to the end and the music needs transparency. The entrance in the tonic key in the tenor halfway through bar 36 (2'35) is the first big climax and brings the only point, two bars later (2'41), where we have all three forms of the subject at once (augmented, original, diminished). Bach gives us a deceptive cadence in bar 60 (4'10), delaying the only close in the piece by another two bars. Contrapunctus 7 «per augmentationem et diminutionem»: Pour ce contrapunctus suivant, Bach avait un grand projet. En plus de la présentation du sujet dans ses formes normales et diminuées, il l’utilise aussi pour la première fois en augmentation, ce qui demande huit mesures. Le sujet augmenté commence à la mesure 5 à la basse (0'19), puis suit son chemin en passant au ténor (mesure 23; 1'37), à l’alto (mesure 35; 2'29) et finalement au soprano (mesure 50; 3'30) où il chante triomphalement. Au-dessus, en dessous et entre ces entrées, les trois autres parties sont engagées dans un échange constant et dans une strette du sujet sous ses autres formes, y compris une double diminution (entendue en premier à la partie de soprano dans la seconde moitié de la mesure 7—0'30). Il n’y a qu’un seul épisode de trois mesures dans toute cette fugue de 61 mesures (mesures 32–34; 2'14). Je choisis de maintenir le début très calme pendant quelque temps, car il y a un long chemin jusqu’à la fin et la musique a besoin de transparence. L’entrée à la tonique au ténor au milieu de la mesure 36 (2'35) est le premier grand point culminant et conduit au seul moment, deux mesures plus tard (2'41), où les trois formes du sujet apparaissent simultanément (augmenté, original, diminué). Bach nous donne une cadence rompue à la mesure 60 (4'10), retardant de deux mesures supplémentaires la seule conclusion du morceau. Contrapunctus 7 „per augmentationem et diminutionem“: Für diesen nächsten Contrapunctus hat Bach einen großartigen Plan. Er stellt nicht nur das Thema in sowohl regulärer als auch verkleinerter Form vor, sondern vergrößert es auch zum ersten Mal; dabei nimmt es eine Länge von insgesamt 8 Takten an. Das vergrößerte Thema beginnt in Takt 5 im Bass (0'19) und arbeitet sich dann hoch zum Tenor (Takt 23; 1'37), in die Altstimme (Takt 35; 2'29) und schließlich in die Sopranstimme (Takt 50; 3'30), in der es triumphierend erklingt. Oberhalb, unterhalb und zwischen diesen Einsätzen tauschen die anderen drei Stimmen ständig untereinander das Thema in seinen anderen Formen aus, so etwa in einer doppelten Diminution (die erstmals im Sopran in der ersten Hälfte von Takt 7 erklingt—0'30). In der gesamten Fuge, die eine Länge von 61 Takten hat, gibt es nur ein Zwischenspiel von drei Takten (Takt 32–34; 2'14). Ich fange stets sehr leise an und behalte das auch eine ganze Weile bei, weil es eine lange Strecke bis zum Schluss ist und die Musik transparent gehalten werden muss. Der Einsatz in der Tonika im Tenor im Takt 36 (2'35) ist der erste große Höhepunkt und zwei Takte später (2'41) kommt der einzige Moment, in dem alle drei Themenformen (Augmentation, Originalform, Diminution) gleichzeitig auftreten. In Takt 60 (4'10) erklingt ein Trugschluss, der das eigentliche Ende des Stücks um zwei weitere Takte hinauszögert. Contrapunctus 8: In Contrapunctus 8 we take a big step into the realm of double and triple fugues that will occupy Bach for the next four numbers. If you look at this great triple fugue without knowing anything about it, you might not at first see the motto theme anywhere in sight. Instead, at the beginning, you see a totally new subject—strutting firmly from one D to another an octave below. This is the first contrapunctus to have only three voices rather than four, but that doesn’t mean it has less strength. On the contrary, it has tremendous scope and grandeur. After 39 bars that deal only with this subject, in creeps a second one, underneath the first (1'13). It has more rhythm than melody, with its insistent repeated notes. At the end of this the bass comments with a new figure (bar 42; 1'18) that becomes significant material (also in its inversion) from now on. This second section, in which the first two subjects are constantly combined, is brought to a half-close in bar 93 (2'53) with something of a flourish. Then what happens? Introduced by that important motif in the bass, a third subject appears in the alto (bar 94; 2'55), which, in the manner of Brahms, has silences on every first beat. You could be forgiven for not immediately recognizing the inverted motto theme. I often like to show students in masterclasses how Bach chooses contrasting material for his subjects and countersubjects so that they easily stand out from each other (and this is why we must also choose a different articulation for each). This is a perfect example. One subject has leaps; another has repeated notes but remains tight; the third is expressive and legato. They all cleverly begin at a different part of the bar. After the exposition of this third subject in all the voices, and more combinations of the first two, we finally come to the first triple counterpoint—all three subjects together (bar 147; 4'34). You might expect something grand for that. But no—they creep in very quietly, almost unnoticed. The first one starts off in A minor and ends up in F major. Before the end of this stunning fugue, Bach gives us four different positions of these combined subjects, gradually building up, with the help of another flourish and a pedal point, to the final triumphant entry of the motto theme in the bass. Contrapunctus 8: Dans le Contrapunctus 8, on fait un grand pas au royaume des doubles et triples fugues qui occuperont Bach dans les quatre numéros suivants. Si l’on regarde cette grande triple fugue sans en rien connaître, on risque de chercher en vain le sujet principal. À la place, au début, vous trouvez un sujet totalement nouveau—se pavanant avec fermeté d’un ré à l’autre à l’octave inférieure. C’est le premier contrapunctus doté de trois voix seulement au lieu de quatre, mais cela ne signifie pas qu’il a moins de puissance. Au contraire, il a une immense portée et beaucoup de grandeur. Après 39 mesures qui ne traitent que de ce sujet, un second se glisse au-dessous du premier (1'13). Il est plus rythmé que mélodique, avec ses notes répétées insistantes. À la fin de ce dialogue, la basse fait des commentaires avec une nouvelle figure (mesure 42; 1'18) qui, à partir de là, devient un matériel important (également dans son inversion). Cette seconde section, où les deux premiers sujets sont constamment associés, converge vers une demi-cadence à la mesure 93 (2'53) avec un peu de fioriture. Que se passe-t-il ensuite? Introduit par ce motif important à la basse, un troisième sujet apparaît à l’alto (mesure 94; 2'55), avec des silences sur tous les premiers temps à la manière de Brahms. On ne vous en voudra pas de ne pas reconnaître immédiatement le sujet principal inversé. J’aime souvent montrer à des élèves, lors de cours d’interprétation, comment Bach choisit des matériels contrastés pour ses sujets et contre-sujets afin qu’ils se distinguent facilement les uns des autres (et c’est la raison pour laquelle il faut aussi choisir une articulation différente pour chacun d’entre eux). Ceci en est un parfait exemple. Dans un sujet, il y a des sauts; dans un autre des notes répétées tout en restant tendu; le troisième est expressif et legato. Et tous commencent astucieusement à un endroit différent de la mesure. Après l’exposition de ce troisième sujet à toutes les voix, et d’autres combinaisons des deux premiers, on arrive enfin au premier contrepoint triple—les trois sujets ensemble (mesure 147; 4'34). On pourrait s’attendre à quelque chose de grandiose pour cela. Mais non—ils se glissent très calmement, presque inaperçus. Le premier commence en la mineur et s’achève en fa majeur. Avant la fin de cette fugue stupéfiante, Bach nous donne quatre positions différentes de ces sujets combinés, s’intensifiant peu à peu, grâce à de nouvelles fioritures et d’une pédale, jusqu’à la triomphale entrée finale du sujet principal à la basse. Contrapunctus 8: Im Contrapunctus 8 tun wir einen großen Schritt in das Reich der Doppel- und Tripelfugen, in dem Bach während der nächsten vier Nummern verweilt. Wenn man diese große Tripelfuge ohne jede Vorkenntnis betrachtet, könnte es durchaus sein, dass man das Motto-Thema zunächst nirgends findet. Stattdessen tritt zu Beginn ein völlig neues Thema in Erscheinung, welches resolut von einem D zum nächsten eine Oktave tiefer stolziert. Es ist dies der erste Contrapunctus mit drei und nicht vier Stimmen, was aber nicht bedeutet, dass er weniger kraftvoll ist. Im Gegenteil—dieses Werk besitzt eine ungeheure Reichweite und Grandezza. Nach 39 Takten, die sich nur mit diesem Thema befassen, kriecht unterhalb jenes ersten Themas ein zweites herbei (1'13). Dieses hat mehr Rhythmus als Melodie und es erklingen insistierende Tonrepetitionen. Am Ende wirft der Bass eine neue Figur (Takt 42; 1'18) ein, die dann zu wichtigem Material wird (auch in der Umkehrung). Dieser zweite Abschnitt, in dem die ersten beiden Themen ständig miteinander verbunden werden, wird in Takt 93 (2'53) mit einer fanfarenartigen Figur zu einem Halbschluss geführt. Was dann? Im Alt (Takt 94; 2'55) wird durch jenes wichtige Motiv im Bass ein drittes Thema eingeführt, welches—Brahms vorwegnehmend—Ruhepausen auf jedem ersten Schlag hat. Es ist verzeihlich, wenn man hier nicht gleich das umgekehrte Motto-Thema wiedererkennt. In Meisterkursen zeige ich den Studenten gerne, wie Bach für seine Themen und Gegenthemen kontrastierendes Material auswählt, so dass sich diese deutlich von einander unterscheiden (und deshalb muss man auch jeweils unterschiedliche Artikulationen wählen). Dies ist ein ideales Beispiel dafür. Ein Thema hat Sprünge; ein weiteres hat Tonrepetitionen, behält jedoch eine feste Struktur; das dritte ist expressiv und legato zu spielen. Sie beginnen raffinierterweise alle an unterschiedlichen Stellen innerhalb des Taktes. Nach der Exposition des dritten Themas in allen Stimmen und weiteren Kombinationen der ersten beiden kommen wir schließlich zum ersten dreifachen Kontrapunkt—alle drei Themen zusammen (Takt 147; 4'34). Dabei könnte man eine große Geste erwarten, doch kommt es anders. Sie schleichen sich ein und werden kaum bemerkt. Das erste beginnt in a-Moll und endet in F-Dur. Vor dem Ende dieser überwältigenden Fuge präsentiert Bach vier verschiedene Positionen dieser kombinierten Themen, die die Spannung allmählich aufbauen und dann mithilfe einer weiteren fanfarenartigen Figur und einem Orgelpunkt den letzten triumphierenden Einsatz des Motto-Themas im Bass erreichen. Contrapunctus 9 ‘alla duodecima’: If virtuosity only means playing in a fast tempo then, up until now, it hasn’t been required. That changes with Contrapunctus 9. Nothing much, however, is gained by playing it presto. In fact Bach had second thoughts about this piece. In the original Berlin autograph, it was placed fifth and the note values were shorter (i.e. instead of quavers, there were semiquavers and the time signature was 4/4 instead of alla breve). In fact that is the case with all the double and triple fugues of the cycle (Nos 8–11). The last Prelude of the Well-Tempered Clavier (B minor, Book II) underwent the same change. No doubt these alterations were made to steer people away from playing them too fast. As Tovey rightly points out, bars 20–21 (0'22) in Contrapunctus 9 would sound ridiculous in too quick a tempo. The running first subject is combined with the motto theme beginning in bar 35 (0'39). With all the scampering around, there is no need for the motto theme to appear in anything but its original, simple version. In bars 85–88 we have two false starts in the soprano and alto (1'37–1'42) before it finally takes off in the bass. This contrapunctus is written in double-counterpoint at the interval of a twelfth, which means the two subjects can swap positions (the upper voice becoming the lower voice) and produce a whole new set of harmonies. Contrapunctus 9 «alla duodecima»: S’il n’y a de virtuosité qu’en jouant dans un tempo rapide, alors, jusqu’ici, elle n’a pas été de rigueur. Mais ça change avec le Contrapunctus 9. Toutefois, on ne gagne pas grand-chose à le jouer presto. En fait, Bach a eu quelques hésitations à propos de ce morceau. Dans la partition autographe originale conservée à Berlin, il était placé en cinquième position et les valeurs des notes étaient plus courtes (par exemple, au lieu de croches, il y avait des doubles croches et la mesure était chiffrée à 4/4 au lieu d’alla breve). C’est en fait le cas de toutes les doubles et triples fugues du cycle (nos 8–11). Le dernier prélude du Clavier bien tempéré (si mineur, Livre II) a subi le même changement. Il ne fait aucun doute que ces modifications furent apportées pour inciter les gens à ne pas les jouer trop vite. Comme le souligne Tovey à juste titre, les mesures 20–21 (0'22) du Contrapunctus 9 auraient l’air ridicules dans un tempo trop rapide. Le premier sujet galopant est associé au sujet principal à partir de la mesure 35 (0'39). Avec toute cette galopade qui l’entoure, le sujet principal n’a aucun besoin de prendre un autre aspect que celui de sa version originale et simple. Aux mesures 85–88, on a deux faux départs au soprano et à l’alto (1'37–1'42) avant qu’il finisse par décoller à la basse. Ce contrapunctus est écrit en double contrepoint à un intervalle de douzième. Cela signifie que les deux sujets peuvent échanger leurs positions (la voix supérieure devenant la voix inférieure) et produire tout un nouveau jeu d’harmonies. Contrapunctus 9 „alla duodecima“: Wenn Virtuosität lediglich mit schnellem Spiel gleichzusetzen ist, dann war sie bis jetzt nicht erforderlich. Das ändert sich mit dem Contrapunctus 9. Allerdings gewinnt man nicht viel, wenn man ihn presto spielt. Tatsächlich war Bach nicht restlos von dem Stück überzeugt. In dem originalen Berliner Manuskript kam es an fünfter Stelle und die Notenwerte waren kleiner (d.h. anstelle von Achteln waren Sechzehntel notiert und die Taktangabe war 4/4 anstelle von Alla breve). So verhält es sich auch bei allen anderen Doppel- und Tripelfugen des Zyklus (Nr. 8–11). Das letzte Präludium des Wohltemperierten Klaviers (h-Moll, Teil II) wurde ebenso verändert. Zweifellos nahm Bach diese Änderungen vor, um die Spieler davon abzuhalten, diese Stücke zu schnell aufzufassen. Tovey weist zu Recht darauf hin, dass Takt 20 und 21 (0'22) des Contrapunctus 9 in einem zu schnellen Tempo lächerlich klingen würden. Das laufende erste Thema wird mit dem Motto-Thema kombiniert, welches in Takt 35 (0'39) beginnt. Bei all diesem Herumgehusche gibt es keinerlei Veranlassung, das Motto-Thema anders als in seiner ursprünglichen, schlichten Version zu spielen. In den Takten 85–88 erklingt ein Fehlstart jeweils in der Sopran- und in der Altstimme (1'37–1'42), bevor es richtig im Bass losgeht. Diese Fuge ist als doppelter Kontrapunkt mit dem Einsatzintervall einer Duodezime komponiert. Das bedeutet, dass die beiden Themen ihre Positionen tauschen können (so dass die Oberstimme zur Unterstimme wird) und sich damit völlig neue Harmonien ergeben. Contrapunctus 10 ‘alla decima’: In its original form, the double fugue of Contrapunctus 10 began in what is now bar 23 (1'02—with the bare subject, not including the bass). When you know only the later version, this is hard to imagine. The opening page is, to quote Tovey, ‘one of the profoundest and most beautiful [Bach] ever wrote’. The rests that we encountered in the variation of the motto theme in Contrapunctus 8 (and that we find again in Contrapunctus 11) return in this initial subject, which, along with two sighing figures, contains a row of gently undulating quavers. It is an expressive gesture, not to be hurried. And already on that first page Bach hints at the main reason for writing a piece in double-counterpoint at the interval of the tenth, which is the doubling in thirds and sixths that this makes possible (0'44). After two of the four voices enter, he then gives us the other two in stretto and in contrary motion. When he does get around to the motto theme in bar 23 (1'02), the voices are spaced to allow maximum clarity. In bar 44 (1'57) Bach combines both subjects together in the inner voices. After some very expressive episodic material, the motto theme is presented in sixths in bar 75 (3'15), with the first subject supporting it in the bass. Then at bar 85 (3'41) we have the first subject presented in thirds with the motto theme in the bass. He will do this twice more before the fugue is finished: in bar 103 (4'28—a particularly beautiful combination), and for the final entrance of the subjects in bar 115 (5'00). I take advantage of the possibility of doubling the motto theme in octaves for the last entry in this extraordinary piece. Note, too, the touching drop from F sharp to F natural in bar 98 (4'15), where the soprano must breathe while the alto holds the tied note. Contrapunctus 10 «alla decima»: Sous sa forme originale, la double fugue du Contrapunctus 10 commençait là où se trouve maintenant la mesure 23 (1'02—avec le sujet à nu sans la basse). Lorsqu’on ne connaît que la version ultérieure, c’est difficile à imaginer. La première page est, pour citer Tovey, «l’une des plus profondes et des plus magnifiques que [Bach] ait jamais écrites». Les silences rencontrés dans la variation du sujet principal dans le Contrapunctus 8 (et que l’on retrouve dans le Contrapunctus 11) reviennent dans ce sujet initial qui, en plus des deux figures soupirantes, comporte une série de croches ondulant avec douceur. C’est un geste expressif qu’il ne faut pas précipiter. Et déjà, dans cette première page, Bach fait allusion à la raison principale d’écrire une pièce en double contrepoint à un intervalle de dixième: permettre la doublure en tierces et en sixtes (0'44). Après l’entrée de deux des quatre voix, il nous donne les deux autres en strette et en mouvement contraire. Lorsqu’il s’approche du sujet principal à la mesure 23 (1'02), les voix sont espacées pour permettre un maximum de clarté. À la mesure 44 (1'57), Bach mêle les deux sujets aux voix internes. Après un matériel épisodique très expressif, le sujet principal est présenté en sixtes à la mesure 75 (3'15), soutenu à la basse par le premier sujet. Puis, à la mesure 85 (3'41), le premier sujet est présenté en tierces avec le sujet principal à la basse, procédé que Bach utilisera encore à deux reprises avant la fin de la fugue: à la mesure 103 (4'28—une combinaison particulièrement belle) et pour l’entrée finale des sujets à la mesure 115 (5'00). Je profite de la possibilité de doubler le sujet principal à l’octave pour la dernière entrée dans cet extraordinaire morceau. Notez aussi l’abaissement très émouvant de fa dièse à fa naturel à la mesure 98 (4'15), où la partie de soprano doit respirer pendant que celle d’alto tient la note liée. Contrapunctus 10 „alla decima“: In ihrer ursprünglichen Form begann die Doppelfuge des Contrapunctus 10 an der Stelle, die jetzt Takt 23 ist (1'02—mit dem bloßen Thema, ohne den Bass). Wenn man nur die spätere Version kennt, kann man sich das kaum vorstellen. Die erste Seite gehört, um Tovey zu zitieren, „zu der tiefgründigsten und schönsten Musik, die [Bach] überhaupt geschrieben hat“. Die Pausen, denen wir in der Variation des Motto-Themas im Contrapunctus 8 begegnet sind (und die wir wieder im Contrapunctus 11 vorfinden), kehren in diesem Anfangsthema zurück, welches nicht nur zwei Seufzerfiguren, sondern auch eine Reihe von sich leicht kräuselnden Achteln enthält. Es ist dies eine expressive Geste, die nicht gehetzt werden sollte. Und bereits auf dieser ersten Seite deutet Bach den Hauptgrund für eine Doppelfuge mit einer Dezime als Einsatzintervall an—dies wird durch die Terz- und Sextdopplungen möglich (0'44). Nachdem zwei der vier Stimmen eingesetzt haben, werden die anderen beiden in einer Engführung und in Gegenbewegung vorgestellt. Wenn das Motto-Thema dann in Takt 23 (1'02) kommt, liegen die Stimmen auseinander, um für größtmögliche Klarheit zu sorgen. In Takt 44 (1'57) kombiniert Bach die beiden Themen in den Mittelstimmen. Nach einem sehr expressiven Zwischenspiel erscheint das Motto-Thema in Takt 75 (3'15) in Sexten, begleitet vom ersten Thema in der Bassstimme. In Takt 85 (3'41) erklingt dann das erste Thema in Terzen und das Motto-Thema im Bass. Dies geschieht noch zwei weitere Male, bevor die Fuge abgeschlossen wird: in Takt 103 (4'28—eine besonders gelungene Kombination) und beim letzten Einsatz der Themen in Takt 115 (5'00). Ich mache von der Möglichkeit Gebrauch, das Motto-Thema beim letzten Einsatz dieses außergewöhnlichen Stücks mit Oktavdopplungen zu spielen. Bemerkenswert ist zudem der anrührende Fall von Fis zu F in Takt 98 (4'15), wo der Sopran atmen muss, während der Alt den gebundenen Ton hält. Contrapunctus 11: When I began work on Contrapunctus 11, I was writing to a distinguished colleague on another matter, and mentioned the hours and hours I was putting into learning this piece. His answer: ‘Ah, our collective nemesis, and one of Bach’s most terrifying pieces!’ Another colleague, an equally distinguished Bach scholar, told me he simply gave up when he got to this point. Even Bach had a crisis with No 11. His plan was to take the three subjects of No 8 and write another fugue with them upside down. That’s exactly what he did, except he realized that it doesn’t quite work. In order to do so, he had to slightly modify the second subject of No 8 (in No 11 presented as the third subject) to make it feasible. I think it’s important to give this fugue a different tempo from No 10. It is somehow more objective and shouldn’t linger. The first section of the contrapunctus uses the motto theme five times, with much use of its tail in the accompanying parts. The next section opens in bar 27 (1'00) with the entrance of the second subject—quite different in character in its inversion (this was one of Bach’s problems—it simply doesn’t resolve when it goes upwards). But at the same time comes a stroke of genius: Bach chose to juxtapose this second subject with a chromatic scale that from then on appears just about non-stop through the rest of the fugue, both ascending and descending. In that way it is similar to the great Ricercare of the Musical Offering (now known to have been written after this contrapunctus). At bars 57 (2'05) and 67 (2'29), Bach turns the second subject the ‘right’ way up again, bringing this section to a close. The third section (2'37) has four entries of the motto theme, again turned the right way up as it was in No 8, and closing in F major. At the end of bar 89 (3'18), the third and final subject (that repeated-note one) is introduced, along with the second subject. Now the going gets complicated. For the next 57 bars the insistent repetitions of this subject become more emphatic, and, thanks also to the chromaticisms, the music pushes more and more at the limits of tonality. So it comes as something of a relief when we fall into C major at the beginning of bar 146 (5'20). This is the point (and within one bar of exactly the same point in No 8) where Bach combines the three subjects together for the first time. The most emotionally intense part of the fugue comes at bar 158 (5'45) where, as in the coda of Contrapunctus 5, he gives us the motto theme both the right way up and upside down simultaneously. He does that once more in the left hand in bar 164 (5'58), and then gives us two more combinations of the three subjects before resolving this rather tortuous piece on a major chord. Contrapunctus 11: Lorsque j’ai commencé à travailler le Contrapunctus 11, j’étais en train d’écrire à un éminent collègue à propos d’une autre question et j’ai fait allusion aux heures et aux heures que je mettais à apprendre ce morceau. Sa réponse: «Ah, c’est notre juste punition collective et l’un des morceaux les plus terrifiants de Bach!». Un autre collègue, un spécialiste de Bach tout aussi éminent, m’a dit avoir tout simplement renoncé quand il était arrivé à ce point. Même Bach eut un problème avec le nº 11. Il avait prévu de prendre les trois sujets du nº 8 et d’écrire une autre fugue en les mettant à l’envers. C’est exactement ce qu’il fit, sauf qu’il découvrit que cela ne fonctionnait pas vraiment. Afin d’y parvenir, il devait modifier légèrement le deuxième sujet du nº 8 (présenté comme troisième sujet dans le nº 11) pour que ce soit possible. Je pense qu’il est important de donner à cette fugue un tempo différent du nº 10. Elle est en fait plus objective et n’a pas besoin de traîner. La première section de ce contrapunctus utilise cinq fois le sujet principal, avec un emploi fréquent de sa queue dans les parties d’accompagnement. La section suivante commence à la mesure 27 (1'00) avec l’entrée du deuxième sujet—de caractère très différent dans son inversion (c’était l’un des problèmes de Bach—il lui est impossible de se résoudre lorsqu’il est ascendant). Mais en même temps arrive le trait de génie: il choisit de le juxtaposer à une gamme chromatique qui, à partir de ce moment-là, est pratiquement omniprésente dans le reste de la fugue, ascendante comme descendante. Elle ressemble ainsi au grand Ricercare de l’Offrande musicale (postérieur comme on le sait aujourd’hui à ce contrapunctus). Aux mesures 57 (2'05) et 67 (2'29), Bach redresse le deuxième sujet dans le «bon» sens, amenant cette section à sa fin. La troisième section (2'37) comporte quatre entrées du sujet principal, à nouveau redressé comme il était dans le nº 8 et s’achevant en fa majeur. À la fin de la mesure 89 (3'18), le troisième et dernier sujet (celui des notes répétées) est introduit, en même temps que le deuxième sujet. C’est alors que les choses se compliquent. Pendant les 57 mesures suivantes, les répétitions insistantes de ce sujet deviennent plus emphatiques et, grâce aussi aux chromatismes, la musique repousse de plus en plus les limites de la tonalité. On voit donc venir avec un certain soulagement l’atterrissage en ut majeur au début de la mesure 146 (5'20). C’est l’endroit (et à une mesure près du moment analogue dans le nº 8) où Bach mélange pour la première fois les trois sujets. La partie la plus intense de la fugue sur le plan émotionnel arrive à la mesure 158 (5'45) où, comme dans la coda du Contrapunctus 5, il nous donne le sujet principal simultanément dans le bon sens et à l’envers, ce qu’il reproduit à nouveau à la main gauche à la mesure 164 (5'58); puis il nous donne deux autres combinaisons des trois sujets avant de résoudre cette pièce assez alambiquée sur un accord majeur. Contrapunctus 11: Als ich mit der Arbeit am Contrapunctus 11 begann, schrieb ich einem angesehenen Kollegen wegen einer anderen Sache, erwähnte jedoch die vielen Stunden, die ich darauf verwendete, dieses Stück zu lernen. Seine Antwort darauf lautete: „Ach ja, unser kollektiver Untergang, und eins der furchterregendsten Stücke Bachs!“ Ein anderer Kollege, ebenfalls ein ausgezeichneter Bach-Spezialist, erzählte mir, dass er selbst an dieser Stelle einfach aufgegeben habe. Selbst Bach hatte bei Nr. 11 eine Krise. Seine Absicht war es, eine Fuge aus den drei Themen von Nr. 8, jedoch in jeweils umgekehrter Form, zu schreiben. Das tat er auch, doch musste er im Thema von Nr. 8 (das in Nr. 11 als drittes Thema auftritt) gewisse harmoniebedingte Intervallkorrekturen anbringen, um das Ganze zu ermöglichen. Es ist meiner Meinung nach wichtig, dieser Fuge ein anderes Tempo zu geben als Nr. 10. Sie ist in gewisser Weise objektiver und braucht nicht zu verweilen. Im ersten Abschnitt erscheint das Motto-Thema fünfmal, wobei der Themenanhang viel in den Begleitstimmen verwendet wird. Der nächste Abschnitt beginnt in Takt 27 (1'00) mit dem Einsatz des zweiten Themas, welches in der Umkehrung einen ganz anderen Charakter hat (das war eine der Schwierigkeiten für Bach—es löst sich einfach nicht auf, wenn es nach oben geht). Gleichzeitig kommt hier allerdings der Geniestreich: er stellt es einer chromatischen Tonleiter gegenüber, die von da an praktisch ununterbrochen zugegen ist, sowohl in aufsteigender als auch absteigender Form. In dieser Hinsicht ähnelt das Stück dem großen Ricercare des Musikalischen Opfers (von dem man heute weiß, dass es nach diesem Contrapunctus entstand). In Takt 57 (2'05) und 67 (2'29) lässt Bach das zweite Thema in der „richtigen“ Form erklingen und beendet damit diesen Abschnitt. Im dritten Abschnitt (2'37) erklingen vier Einsätze des Motto-Themas, wiederum in der ursprünglichen Form (also wie in Nr. 8), und es schließt in F-Dur. Am Ende von Takt 89 (3'18) wird das dritte und letzte Thema (mit den Tonrepetitionen) vorgestellt; dazu erklingt das zweite Thema. Jetzt wird es kompliziert. Über die nächsten 57 Takte hinweg werden die ohnehin beharrlichen Wiederholungen innerhalb dieses Themas noch emphatischer und die Musik fordert (unter anderem aufgrund der Chromatik) die Grenzen der Tonalität immer mehr heraus. So ist es durchaus erleichternd, wenn wir zu Beginn von Takt 146 (5'20) in C-Dur landen. An dieser Stelle (die sich um nur einen Takt versetzt mit der entsprechenden Stelle in Nr. 8 deckt) führt Bach zum ersten Mal alle drei Themen zusammen. Der emotional intensivste Abschnitt dieser Fuge kommt in Takt 158 (5'45), wo—ebenso wie in der Coda des Contrapunctus 5—das Motto-Thema gleichzeitig in der originalen wie auch in der umgekehrten Form auftritt. Das wird in der linken Hand in Takt 164 (5'58) noch einmal wiederholt und dann kommen zwei weitere Kombinationen der drei Themen, bevor dieses lange und komplexe Stück auf einem Durakkord endet. Contrapunctus 12 (Rectus and Inversus): Having got this far in his master plan, Bach wasn’t going to give up. Not satisfied with inverting only subjects, he decided to write two contrapuncti which could be completely turned upside down, from the first note to the last. These ‘mirror’ fugues couldn’t be more contrasting. Contrapunctus 12, a four-voice fugue in triple time, is very archaic-sounding. David Schulenberg, in his book The Keyboard Music of J.S. Bach, points out the similarity between this piece and a ‘mirror’ chorale setting by Buxtehude (Mit Fried und Freud) written in 1674. Much of the Rectus version is in the lower part of the keyboard, giving it a very dark quality. A slow tempo, resembling that of a sarabande, seems advisable and gives you the time needed for the unusually big stretches. Beginning in bar 21 (1'03), Bach fills in the intervals in the subject, giving it a greater sense of flow. There are some hints at stretto that don’t materialize. The pedal point in bar 50 (2'34) supports the last entrance of the subject in the tenor, with false entries in the upper voices. On the piano, played by only two hands, this piece needs a great deal of clarity if it is not to sound muddy. The Inversus is more filled with light, and the cadential flourish at the end, which in the ascending Rectus version is a gesture of hope, becomes one of finality when descending in the bass. Contrapunctus 12 (Rectus et Inversus): Après être allé aussi loin dans son plan d’ensemble, Bach n’allait pas abandonner. Non content d’inverser seulement des sujets, il décida d’écrire deux contrapuncti susceptibles d’être complètement renversés, de la première à la dernière note. Ces fugues en «miroir» ne sauraient être plus contrastées. Le Contrapunctus 12, une fugue à quatre voix de rythme ternaire, semble très archaïque. Dans son livre The Keyboard Music of J. S. Bach, David Schulenberg souligne la similitude entre ce morceau et un choral en «miroir» de Buxtehude (Mit Fried und Freud) écrit en 1674. Une grande partie de la version Rectus se situe dans le grave du clavier, ce qui lui donne un caractère très sombre. Un tempo lent, analogue à celui d’une sarabande, semble recommandé et donne le temps requis pour les écarts d’une exceptionnelle ampleur. À partir de la mesure 21 (1'03), Bach remplit les intervalles dans le sujet, ce qui lui donne une impression d’écoulement accrue. Il y a quelques esquisses de strette qui ne se matérialisent pas. La pédale à la mesure 50 (2'34) soutient la dernière entrée du sujet au ténor, avec de fausses entrées aux voix supérieures. Au piano, joué seulement à deux mains, ce morceau requiert beaucoup de clarté pour ne pas paraître confus. L’Inversus est plus lumineux et la cadence ornementée à la fin, qui dans la version Rectus ascendante est un geste d’espoir, prend un caractère définitif lorsqu’il descend à la basse. Contrapunctus 12 (Rectus und Inversus): Nachdem er in seinem Gesamtkonzept so weit vorangeschritten war, beabsichtigte Bach nicht, das Projekt aufzugeben. Nicht damit zufrieden, nur die Themen umzukehren, schrieb er zwei Contrapuncti, die ihrerseits vom ersten bis zum letzten Ton völlig umgekehrt werden konnten. Diese „Spiegelfugen“ könnten allerdings unterschiedlicher nicht sein. Der Contrapunctus 12 ist eine vierstimmige Fuge im Dreiertakt und mutet sehr altmodisch an. David Schulenberg weist in seinem Buch The Keyboard Music of J.S. Bach auf die Ähnlichkeit zwischen diesem Stück und einer „Spiegel“-Choralvertonung von Buxtehude (Mit Fried und Freud) aus dem Jahr 1674 hin. Ein großer Teil der Rectus-Version spielt sich im unteren Teil der Klaviatur ab und erscheint damit recht düster. Hier passt ein langsames Tempo, wie etwa das einer Sarabande, wohl am besten, da man so auch genügend Zeit für die ungewöhnlich weiten Intervalle hat. Ab Takt 21 (1'03) werden die Intervalle in dem Thema sozusagen aufgefüllt, so dass sich ein größerer musikalischer Fluss einstellt. Engführungen werden mehrmals angesteuert, allerdings nicht durchgeführt. Der Orgelpunkt in Takt 50 (2'34) unterstützt den letzten Themeneinsatz im Tenor, wobei unvollständige Themeneinsätze in den oberen Stimmen erfolgen. Wenn dieses Stück von nur zwei Händen auf dem Klavier gespielt wird, ist besondere Deutlichkeit vonnöten, wenn der Klang nicht schwammig wirken soll. Der Inversus ist lichterfüllter und die kadenzartige Figur am Ende, die in der Rectus-Version eine Geste der Hoffnung ist, besitzt hier eine Endgültigkeit, wenn sie im Bass in die Tiefe steigt. Contrapunctus 13 (Rectus and Inversus): Bach must have realized that he was demanding a lot in asking for No 12 to be played by only ten fingers. Perhaps had he lived longer he might have done what he did for Contrapunctus 13: he wrote a second version of it for two keyboards, four hands, adding a fourth voice to the already existing three. It is, however, not impossible for only one person to play it. It just needs a lot of lightness and agility, a few broken leaps, and, on the piano, some judicious use of the pedal. The variant of the motto theme is a dance-like, playful one in triplets—much needed after the sombreness of the previous contrapunctus (and a theme that inspired Brahms in the last movement of his Cello Sonata No 1 in E minor). Not only does Bach turn this fugue upside down, he also turns it inside out: the top becomes the middle; the middle becomes the bass; and the bass becomes the top! Contrapunctus 13 (Rectus et Inversus): Bach avait dû comprendre qu’il était trop exigeant en demandant de jouer le nº 12 avec dix doigts seulement. S’il avait vécu plus longtemps, peut-être aurait-il fait ce qu’il fit pour le Contrapunctus 13: il en écrivit une seconde version pour deux claviers, quatre mains, ajoutant une quatrième voix aux trois voix déjà existantes. Toutefois il n’est pas impossible qu’il soit joué par une seule personne. Il faut juste beaucoup de légèreté et d’agilité, quelques sauts brisés et, au piano, un usage judicieux de la pédale. La variante du sujet principal est dansante et enjouée avec ses triolets—ce dont on a vraiment besoin après le côté sombre du précédent contrapunctus (et un thème qui inspira Brahms dans le dernier mouvement de sa Sonate pour violoncelle et piano nº 1 en mi mineur). Non seulement, Bach renverse cette fugue, mais il la bouleverse totalement: la partie supérieure devient la partie médiane; la partie médiane devient la basse; et la basse passe à la partie supérieure! Contrapunctus 13 (Rectus und Inversus): Bach muss realisiert haben, dass er viel verlangte, wenn er Nr. 12 von nur zehn Fingern gespielt haben wollte. Vielleicht hätte er, wenn er länger gelebt hätte, es hier ebenso gehalten wie beim Contrapunctus 13, von dem er eine zweite Version für zwei Tasteninstrumente—vier Hände—anfertigte und noch eine vierte Stimme zu den drei bereits existierenden hinzufügte. Es ist jedoch nicht unmöglich, dass nur eine Person das Stück spielt. Es muss dann mit Leichtigkeit und Geschicklichkeit aufgefasst werden, mit einigen gebrochenen Sprüngen und, am Klavier, mit wohlüberlegtem Einsatz des Pedals. Die Variante des Motto-Themas ist tänzerisch und spielerisch gehalten und steht in Triolen, was nach der Düsterkeit der vorherigen Fuge dringend nötig ist (dieses Thema war zugleich eine Inspirationsquelle für den letzten Satz von Brahms’ Cellosonate Nr. 1 in e-Moll). Diese Fuge wird von Bach nicht nur auf den Kopf gestellt, sondern auch umgekrempelt: die Oberstimme wird zur Mittelstimme, die Mittelstimme wird zum Bass, und der Bass wird zur Oberstimme! Canon per augmentationem in contrario motu: Already with Contrapunctus 12 there is some discussion of which version is the Rectus and which is the Inversus (I choose the Rectus to be the one that starts with the subject in its inversion). But that debate is nothing compared to the problems we face at this point regarding what should come next. In the first edition the four canons are placed before what is now known as Contrapunctus 14, and in the order in which I present them on this recording. Many scholars think that the first one, the augmentation canon, should be placed last in the group. Perhaps that is true. But I can tell you this: when you are performing The Art of Fugue complete, it’s a very good idea to separate Contrapunctus 13 and the canon at the octave, unlike the order they advocate. Otherwise you have two lively pieces, both using triplets, next to each other. By placing the augmentation canon at the beginning of the group, we are afforded more contrast. When you listen to this piece of music without looking at the score, you might wonder what on earth you are listening to. Looking at it on the page, you immediately see what Bach has done. A very beautiful variant of the motto theme, gently paced, starts off this canon in the top voice. Then the lower voice enters with the same music turned upside down and its note values stretched to twice their length (0'10). Halfway through he reverses the leadership role, giving the leading voice to the bass (2'06). Canon per augmentationem in contrario motu: Pour le Contrapunctus 12, il y a déjà un certain débat pour déterminer quelle version est le Rectus et laquelle est l’Inversus (pour moi le Rectus est celle qui commence avec le sujet dans son inversion). Mais ce débat n’est rien comparé aux problèmes qui surgissent à ce stade pour savoir ce qui doit suivre. Dans la première édition, les quatre canons sont placés avant ce que l’on désigne aujourd’hui comme le Contrapunctus 14; c’est l’ordre dans lequel je les présente dans cet enregistrement. De nombreux érudits pensent que le premier, le canon en augmentation, devrait être placé en dernier. C’est peut-être exact. Mais je peux vous dire ceci: lorsque l’on joue L’Art de la fugue en entier, c’est une excellente idée de séparer le Contrapunctus 13 et le canon à l’octave, contrairement à l’ordre qu’ils préconisent. Sinon, on a côte à côte deux pièces pleines d’entrain, écrites toutes deux en triolets. En plaçant le canon en augmentation au début du groupe, on aura davantage de contraste. Lorsque l’on écoute ce morceau de musique sans regarder la partition, on peut se demander ce que l’on est en train d’écouter. En le lisant sur le papier, on voit immédiatement ce que Bach a fait. Une très belle variante du sujet principal, à une douce allure, démarre ce canon à la voix supérieure. Ensuite la voix inférieure entre avec la même musique à l’envers, sur des valeurs deux fois plus longues (0'10). Au milieu, Bach inverse le rôle du meneur qu’il confie à la basse (2'06). Canon per augmentationem in contrario motu: Schon im Falle des Contrapunctus 12 wird diskutiert, welche Version der Rectus und welche der Inversus ist (ich gehe davon aus, dass der Rectus die Version ist, die mit dem Thema in Umkehrung beginnt). Diese Debatte ist jedoch nichts im Vergleich zu der Frage, die uns an dieser Stelle begegnet, nämlich wie es nun weitergehen soll. In der Erstausgabe kommen die vier Kanons vor dem Stück, welches heute als Contrapunctus 14 bekannt ist, und an diese Reihenfolge halte ich mich auch bei der vorliegenden Einspielung. Viele Forscher sind der Ansicht, dass der erste Kanon, der Augmentationskanon, an letzter Stelle in der Gruppe kommen sollte. Möglicherweise stimmt das. Doch kann ich Folgendes dazu sagen: Wenn man Die Kunst der Fuge als Ganzes aufführt, ist es durchaus sinnvoll, den Contrapunctus 13 von dem Oktavkanon zu trennen (die aufeinander folgen würden, hielte man sich an jene Forscher-Ansicht), da sonst zwei lebhafte Stücke, in denen jeweils Triolen vorkommen, nebeneinander stehen. Wenn man also den Augmentationskanon an den Beginn der Gruppe stellt, sorgt man für mehr Abwechslung. Wenn man dieses Stück anhört, ohne dabei in die Noten zu schauen, kann die Reaktion durchaus eine von großer Verwirrung sein. Wenn man allerdings das Notenbild zu sehen bekommt, wird gleich klar, was Bach hier gemacht hat. Eine wunderschöne Variante des Motto-Themas beginnt den Kanon im behutsamen Tempo in der Oberstimme. Dann setzt die Unterstimme mit derselben Musik ein, allerdings in gespiegelter Form und mit doppelt so langen Notenwerten (0'10). Nach der Hälfte dreht Bach die Rollen um und übergibt der Bassstimme die Führung (2'06). Canon alla ottava: It is good to have a brilliant movement at this point and the canon at the octave fulfils that role well. The jig-like motto theme variant in 9/16 time is inverted at bar 41 (0'50). This is a canon in perpetuity, meaning that it could go on for ever without finishing (emphasized by the repeat sign which I have chosen not to observe). Bach does, however, bring it to a close by adding a coda of five bars (2'04) in which the right hand dramatically crosses over the left. Canon alla ottava: C’est une bonne chose d’avoir un mouvement brillant à cet endroit et le canon à l’octave remplit très bien ce rôle. La variante à 9/16 du sujet principal sur un rythme de gigue est inversée à la mesure 41 (0'50). C’est un canon perpétuel, ce qui signifie qu’il pourrait continuer à perpétuité sans jamais s’achever (ce que confirme le signe de reprise que j’ai choisi de ne pas observer). Toutefois, Bach y met fin en ajoutant une coda de cinq mesures (2'04) où la main droite se croise de façon spectaculaire avec la main gauche. Canon alla ottava: Ein brillanter Satz an dieser Stelle ist strategisch sinnvoll und der Oktavkanon erfüllt diese Rolle sehr gut. Die Gigue-artige Variante des Motto-Themas in 9/16 wird in Takt 41 (0'50) umgekehrt. Es ist dies ein Zirkelkanon, was bedeutet, dass er unendlich weitergeführt werden könnte (was durch das Wiederholungszeichen, das ich in diesem Falle jedoch nicht beachte, betont wird). Bach schließt das Werk ab, indem er eine fünftaktige Coda anfügt (2'04), wo die rechte Hand in dramatischer Weise die linke überkreuzt. Canon alla decima in contrapunto alla terza: The next canon has a double time signature, both 4/4 and 12/8. It begins in sombre mood with the inverted subject in the bass—now syncopated and with the tail dotted. When the right hand then enters, at the interval of a tenth (0'16), the left hand introduces triplets that provide a gentle accompaniment to the subject. These triplets are soon shortened to become sextuplets. They must stay light and unhurried if the piece is to maintain its gentle character. As in the augmentation canon, the parts are reversed halfway through at bar 40 (2'10). I choose not to assimilate the dotted rhythm with the triplet, so as to emphasize the dual time signature. To bring this canon to a conclusion, Bach diminishes the syncopated subject in bar 79 (4'19) in the left hand with two bars that are definitely in 4/4 and not 12/8. The music comes to a pause, at which point he writes the word ‘cadenza’ (4'27). I add a simple flourish in the right hand, giving the triplets a last chance to appear. Canon alla decima in contrapunto alla terza: Le canon suivant a un double chiffrage des mesures, à la fois 4/4 et 12/8. Il commence dans une atmosphère sombre avec le sujet inversé à la basse—maintenant syncopé et avec la queue pointée. Lorsque la main droite entre, à un intervalle de dixième (0'16), la main gauche introduit des triolets qui constituent un doux accompagnement pour le sujet. Ces triolets sont vite écourtés pour devenir des sextolets. Ils doivent rester légers et tranquilles pour conserver au morceau son caractère de douceur. Comme dans le canon en augmentation, les parties sont inversées au milieu à la mesure 40 (2'10). Je choisis de ne pas assimiler le rythme pointé à celui du triolet, afin de souligner le double chiffrage des mesures. Pour mener ce canon à une conclusion, Bach réduit le sujet syncopé à la mesure 79 (4'19) à la main gauche avec deux mesures qui sont sans conteste à 4/4 et non à 12/8. La musique arrive à un point d’orgue à l’endroit où il écrit le mot «cadenza» (4'27). J’ajoute une simple ornementation à la main droite, ce qui donne aux triolets l’occasion de faire une dernière apparition. Canon alla decima in contrapunto alla terza: Der nächste Kanon hat zwei Taktbezeichnungen, sowohl 4/4 also auch 12/8. Er beginnt in trüber Stimmung mit umgekehrtem Thema im Bass—hier synkopiert und mit punktiertem Themenanhang. Wenn die rechte Hand dann im Dezimabstand einsetzt (0'16), spielt die linke Hand Triolen, die für eine sanftmütige Begleitung des Themas sorgen. Bald darauf werden diese Triolen gekürzt, so dass sie Sextolen werden, doch müssen sie leicht und ungehetzt bleiben, wenn das Stück seinen sanften Charakter beibehalten soll. Ebenso wie im Augmentationskanon werden die Rollen nach der Hälfte, in Takt 40 (2'10), vertauscht. Ich habe mich dafür entschieden, den punktierten Rhythmus nicht mit den Triolen zu assimilieren, so dass die doppelte Taktbezeichnung betont wird. Um den Kanon abzuschließen, verkleinert Bach das synkopierte Thema in Takt 79 (4'19) in der linken Hand in zwei Takten, die eindeutig in 4/4 stehen, und nicht in 12/8. Die Musik pausiert; an dieser Stelle hat Bach das Wort „Kadenz“ notiert (4'27). Ich füge eine schlichte Verzierung in der rechten Hand hinzu, so dass die Triolen ein letztes Mal auftreten können. Canon alla duodecima in contrapunto alla quinta: This last canon uses a very attractive variant of the motto theme as its subject. It sounds rather like a two-part invention or one of the Vier Duette from Clavierübung III. It is another perpetual canon in which the leadership role reverses at bar 34 (0'54). The canons of The Art of Fugue, unlike those in the 'Goldberg' Variations, have no third voice to accompany the dialogue. But there is beauty to be found in severity, and we should let them speak simply without trying to add too much in the way of ‘interpretation’. Canon alla duodecima in contrapunto alla quinta: Ce dernier canon prend pour sujet une variante très séduisante du sujet principal. Il ressemble plutôt à une invention à deux voix ou à l’un des Vier Duette du Clavierübung III. C’est un autre canon perpétuel où le rôle de meneur s’inverse à la mesure 34 (0'54). Les canons de L’Art de la fugue, contrairement à ceux des Variations «Goldberg», n’ont pas de troisième voix pour accompagner le dialogue. Mais il y a de la beauté dans la sévérité et il faut se contenter de les laisser parler sans chercher à trop en ajouter en matière d’«interprétation». Canon alla duodecima in contrapunto alla quinta: In diesem letzten Kanon erklingt eine besonders schöne Variante des Motto-Themas als Thema. Es klingt nach einer zweistimmigen Invention oder einem der Vier Duette aus der Clavierübung III. Hierbei handelt es sich um einen weiteren Zirkelkanon, in dem die Rollen in Takt 34 vertauscht werden (0'54). Die Kanons der Kunst der Fuge haben, anders als diejenigen der „Goldberg“-Variationen, keine dritte Stimme, die den Dialog begleitet. Die strenge Form besitzt jedoch ihre eigene Schönheit, und man sollte die Stimmen einfach sprechen lassen, ohne zu viel „Interpretation“ hinzufügen zu wollen. Contrapunctus 14 (Fuga a 3 soggetti): Now we come to the great enigma: Contrapunctus 14, or ‘Fuga a 3 soggetti’ (‘Fugue with three subjects’) as it was called in the first edition; the fugue that Bach left incomplete upon his death. Some scholars think that it doesn’t even belong in The Art of Fugue. For me it does. I only have to play the opening six bars, after all that has come before, and I feel this is its rightful place. The first subject is drastically simple, hugely expressive despite its bleakness. For 114 bars it is used, also in stretto and inversion, to give us some of the most beautiful and perfect part-writing in all the keyboard works of Bach. In bar 114 (4'40), in the alto voice, the second subject enters—more flowing to stand out easily against the first subject. In bar 148 (5'52) these two subjects are combined for the first time. I find the combination in bar 169 (6'37), in F major, particularly beautiful. The climax of this section comes when, beginning in bar 180 (6'59), the second subject in the bass supports two entries of the first subject in stretto in the alto and soprano voices. Several people have written conclusions to Contrapunctus 14, including Tovey. I have chosen to leave it incomplete. The effect created, especially in performance, when such eternally flowing music comes to a stop takes our breath away and creates an even greater sense of awe than if it were finished. Contrapunctus 14 (Fuga a 3 soggetti): On en arrive ici à la grande énigme: Contrapunctus 14 ou «Fuga a 3 soggetti» («Fugue à trois sujets») comme le désignait la première édition; la fugue que Bach a laissé inachevée à sa mort. Certains érudits pensent qu’elle n’appartient même pas à L’Art de la fugue. Pour moi, elle en fait partie. Il me suffit de jouer les six premières mesures, après tout ce qui a précédé, pour sentir qu’elle est à sa juste place. Le premier sujet est très simple, extrêmement expressif malgré sa sévérité. Il est utilisé pendant 114 mesures, également en strette et en inversion, nous donnant certains des plus beaux exemples d’une conduite des voix magnifique et parfaite dans toutes les œuvres pour clavier de Bach. À la mesure 114 (4'40), à la voix d’alto, entre le deuxième sujet—plus fluide afin de ressortir davantage sur le premier sujet. À la mesure 148 (5'52), ces deux sujets sont associés pour la première fois. Je trouve particulièrement belle la combinaison de la mesure 169 (6'37), en fa majeur. Le sommet de cette section arrive lorsque, à partir de la mesure 180 (6'59), le deuxième sujet à la basse soutient deux entrées du premier sujet en strette aux voix d’alto et de soprano. Nombreux sont ceux qui ont cherché à terminer le Contrapunctus 14, y compris Tovey. J’ai choisi de le laisser inachevé. Lorsque cette musique tellement fluide s’arrête, cela produit un effet à vous couper le souffle, surtout au concert, et inspire encore davantage de respect mêlé d’admiration que si elle était achevée. Contrapunctus 14 (Fuga a 3 soggetti): Jetzt kommen wir zu dem großen Rätsel: Contrapunctus 14, beziehungsweise die „Fuga a 3 soggetti“ („Fuge mit drei Themen“), wie das Stück in der Erstausgabe bezeichnet wurde; jene Fuge, die Bach unvollendet hinterließ. Einige Forscher sind der Ansicht, dass sie gar nicht zur Kunst der Fuge gehört. Für mich gibt es da keine Frage—ich muss nur die ersten sechs Takte spielen, und nach allem, was vorangegangen ist, scheint mir dies die richtige Stelle für dieses Stück. Das erste Thema ist äußerst schlicht gehalten und trotz seiner Kargheit ungeheuer ausdrucksstark. Über 114 Takte hinweg wird es eingesetzt, unter anderem auch in Engführungen und Umkehrungen, und demonstriert mit die schönste und vollkommenste Stimmführung von allen Bach’schen Werken für Tasteninstrumente. In Takt 114 (4'40) setzt das zweite Thema in der Altstimme ein, welches fließender gestaltet ist, so dass es sich deutlich vom ersten Thema abhebt. In Takt 148 (5'52) werden diese beiden Themen zum ersten Mal miteinander kombiniert. Ich finde die Kombination in Takt 169 (6'37), in F-Dur, besonders schön. Der Höhepunkt dieses Abschnitts kommt, wenn das zweite Thema ab Takt 180 (6'59) im Bass die beiden Einsätze des ersten Themas in den enggeführten Alt- und Sopranstimmen begleitet. Mehrere Menschen haben Schlussteile für den Contrapunctus 14 geschrieben, darunter auch Tovey. Ich habe mich dazu entschlossen, ihn unvollständig zu belassen. Der Effekt, der sich, insbesondere im Konzert, einstellt, wenn eine fortwährend fließende Musik zum Stillstand kommt, ist atemberaubend und sorgt für eine noch stärkere Ehrfurcht, als wenn sie zu Ende gebracht würde.